Japan is one of the developed countries, but it's not always true. 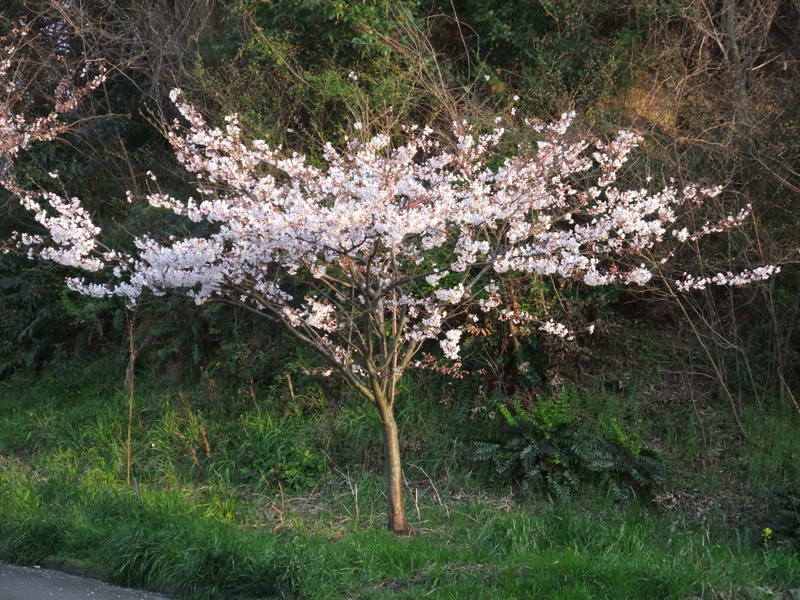 The biggest municipal park, Matsuyama Comprehensive Park, is near my house. It's very popular for every age. Aged people, including my parents, enjoy walking in the early morning. There are many outdoor play equipments for kids. It is also suitable for hiking. 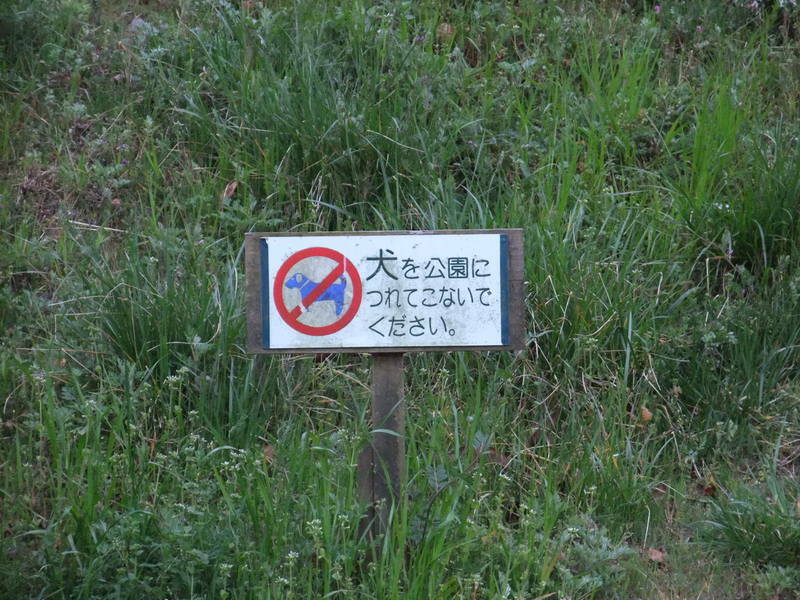 However, walking dogs is prohibited. I imagine it's because of bad manners of dog keepers. The picture shows the sign saying "Don't let the dogs in!". I like walking with my dog and want the city to lift this rule, but now it hasn't come true. Other developed countries' people wouldn't believe it. Japan is under-developing at least in this field. I took half day off today to apply for the riding license. 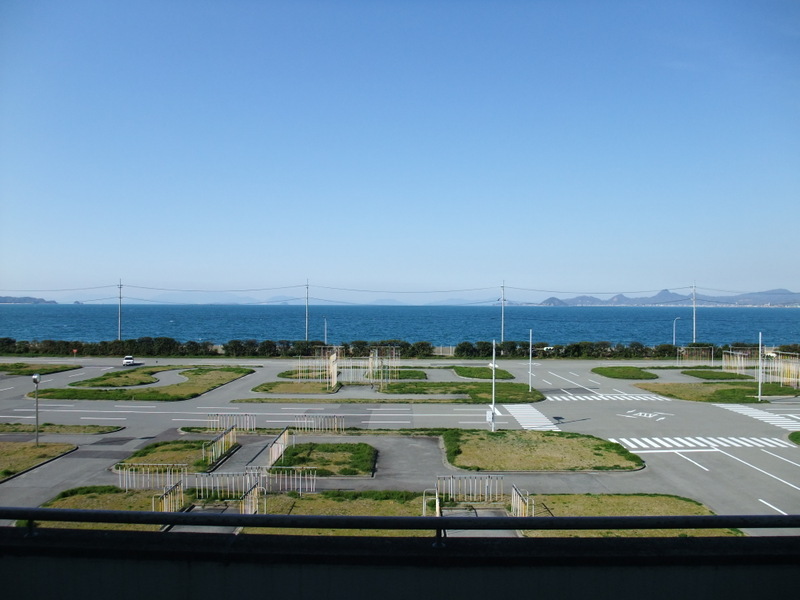 The department which deals with driving license affairs is located at the north of the city facing Seto Inland Sea. It took 20 minutes from my office by my scooter, but the weather was great and it was comfortable to ride my scooter. I've already had my driving license and the permission for riding big motorcycles was added to it. I was so happy to see the license, because I had been eager to get it for the last 30 years. I took a walk around the license center while waiting for the issue and took pictures. The picture was taken from the second floor of the license center. It shows the course and Seto Inland Sea. 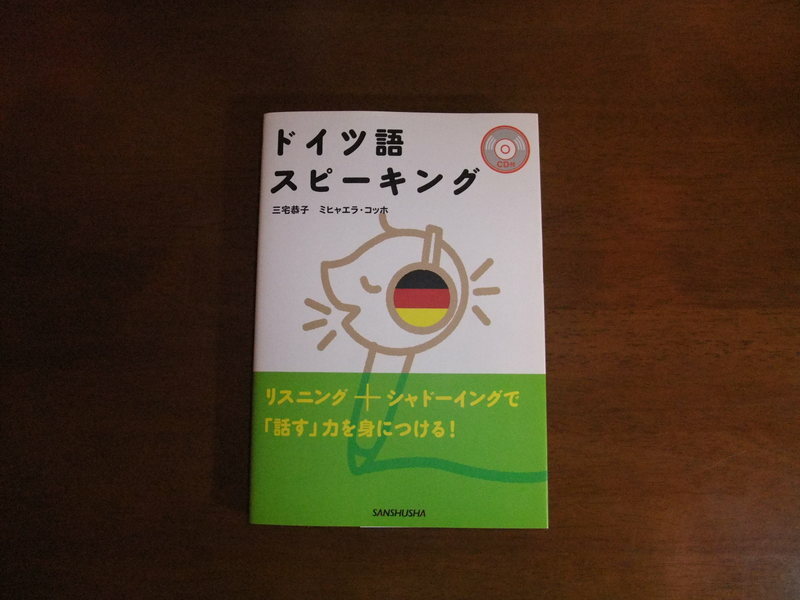 I'm planning to visit Germany this summer with my second daughter, who can speak a little German. I'm wondering if there are some travel agents or someone in the travel industry in the group. If I knew those people, it would be helpful for our trip. I'd rather stay at a B&B, a kind of dormitory, youth hostel, or something like these than a luxurious hotel. I heard that the system of youth hostel originated from Germany in the early 20th century. What would the original youth hostel be like? I'm very interested. I've been struggling to get the big motorcycles license for these past three months. As I wrote about this topic before, this license isn't easy to get, but I got it today. I'm so happy. My youngest brother has already gotten it and has a super big motorcycle that is shown in the picture. 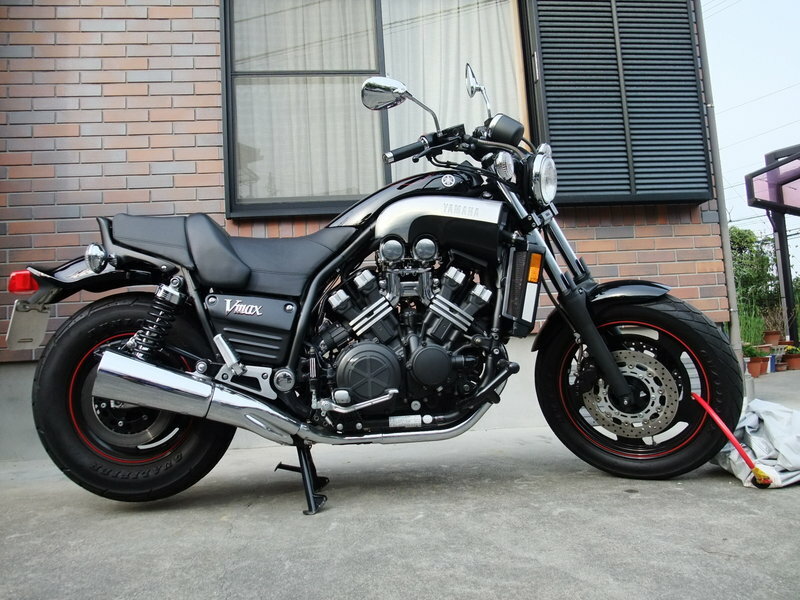 The displacement of the motorcycle is 1200cc, the engine of which must be unbelievably strong. I'm going to rent it from him from time to time, and buy my own in the near future. My wife found a newspaper ad about the table manner class today. Our second daughter, Yuri, is at home for her spring vacation now and we decided to apply for it. Yuri has attended such a class from her high school before, but our youngest daughter, Ann, has never experienced this kind of lecture. 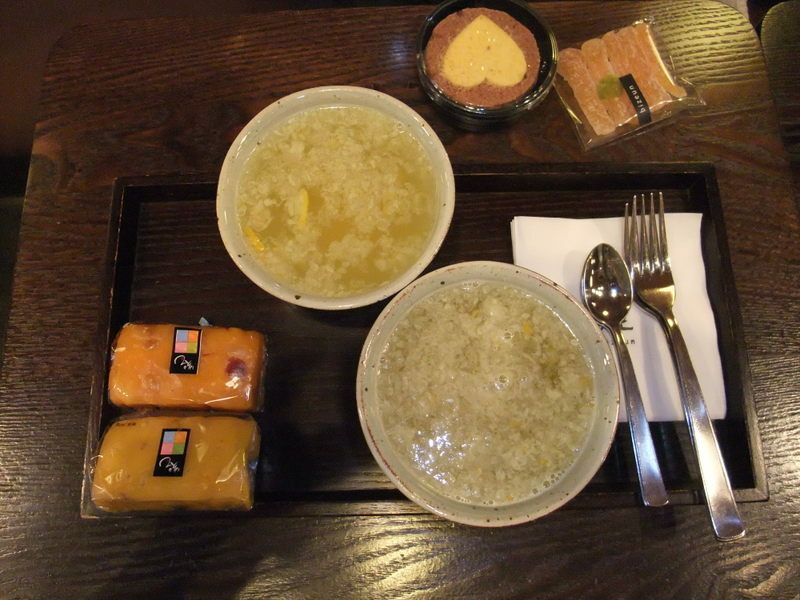 Our formal lunch started with a potage soup, followed by an appetizer, two main dishes, one of which was meat and the other was fish, and some more. While tasting dishes, the chief chef came out of the kitchen and gave us a lecture for about 20 minutes. His lecture was really nice and useful. My wife and I think that our daughters must acquire formal ways of eating, wearing kimono, tea ceremony and similar things as an adult. We are going to make them try something difficult to eat, such as fish with bones, oysters with shell, lobsters, and so on next time. 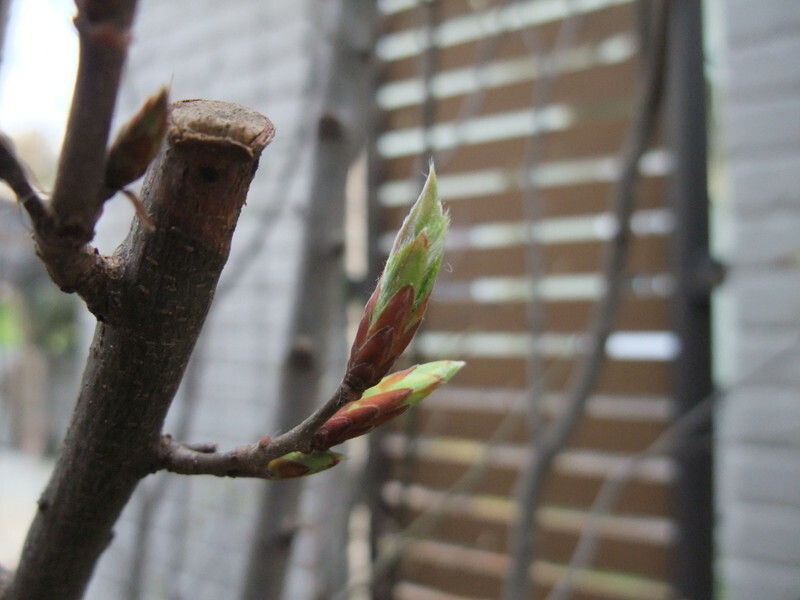 A practitioner that has about fifty inpatients asked me to stay 24 hours at his hospital, because he had to visit his daughter's dormitory in Tokyo. He isn't allowed to go out of the hospital without a substitute doctor. He earns big money, but I felt sympathy with him. He is deprived of his free time. We enjoyed this trip to our hearts' content. I was glad to spend a few days with my daughter. 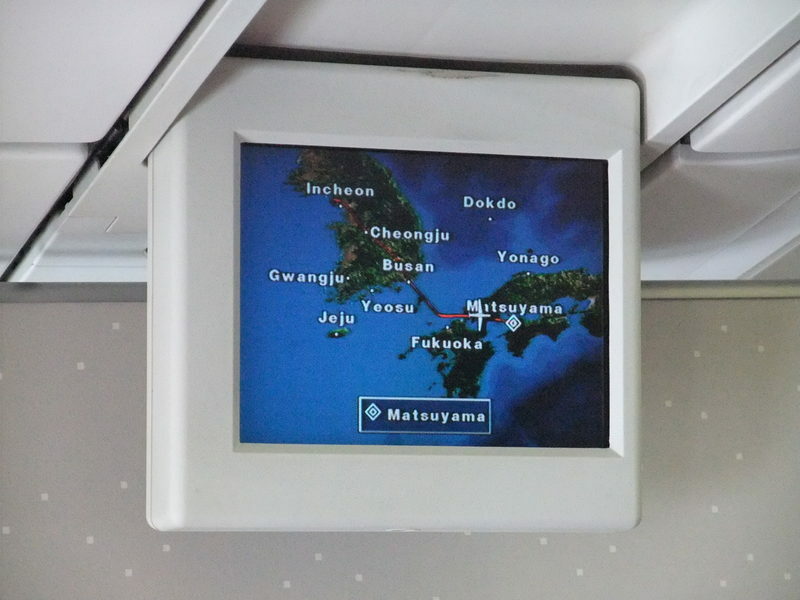 The plane for Matsuyama was being prepared for take-off in the first picture. 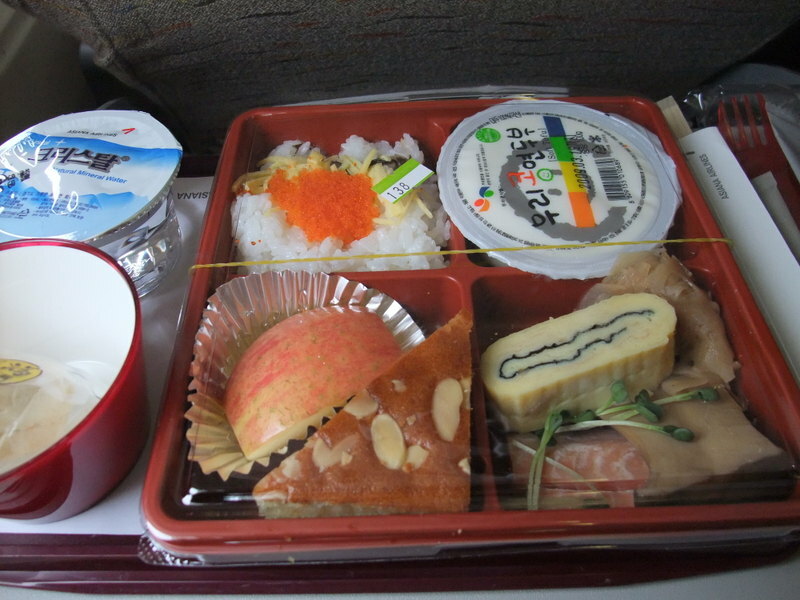 The second picture was of the meal in the plane. It was not good, but it's ok because I had many good memories of this trip. Through this trip, I began to feel friendly for South Korea. I will visit the country again and again. Next time,,,, I would maybe choose Jeju Island. By the way, look at the third picture. It was of the display in the cabin. 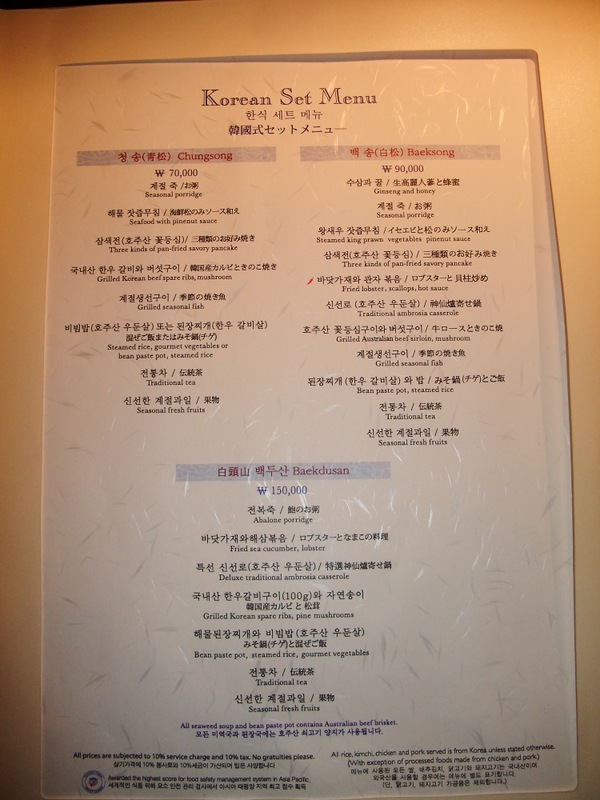 Dokdo was displayed on it. I couldn't help laughing at it. As I wrote about this small island or rocks several times before, I won't repeat it here. However, it will take more and more time for Korean to grow up. If you want to read it, click the archives for "Korea" and search "takeshima". You'll find nine entries about that. When I switched on my cellular phone in Matsuyama Airport, I received an e-mail from my daughter with the last picture attached. I bought her an iPOD in a duty free shop in Incheon Airport. 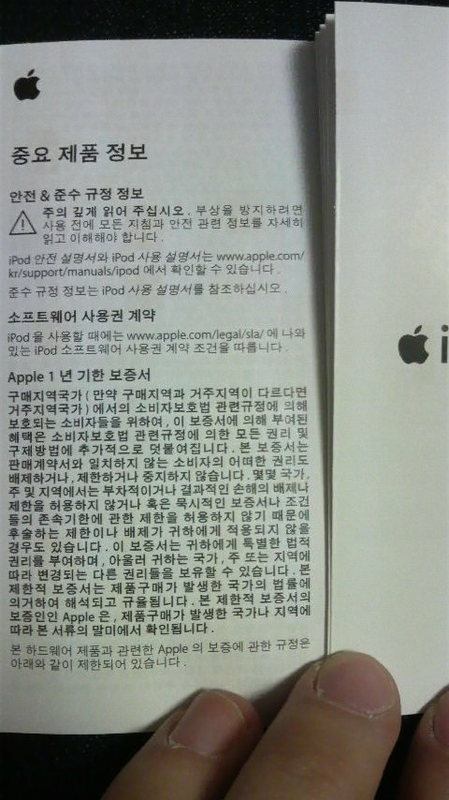 She told me that the manual for it was written in Korean. It was a nice punch line at the end of the trip. I had to kill time in Incheon Airport. I thought about how to do it. Going out of the airport flitted througn my mind, but I was afraid I could lose my way back and I gave that up. I took a walk in the airport. 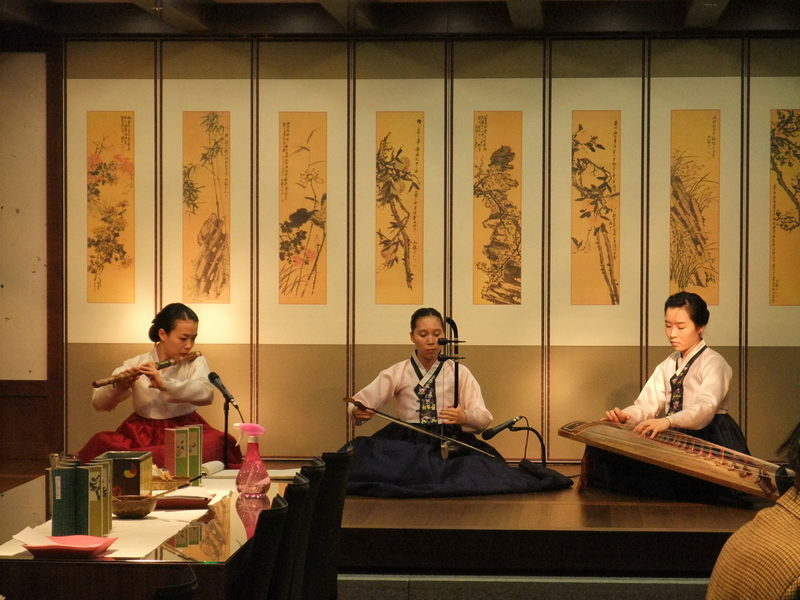 I heard a tuneful melody of traditional Korean instruments. 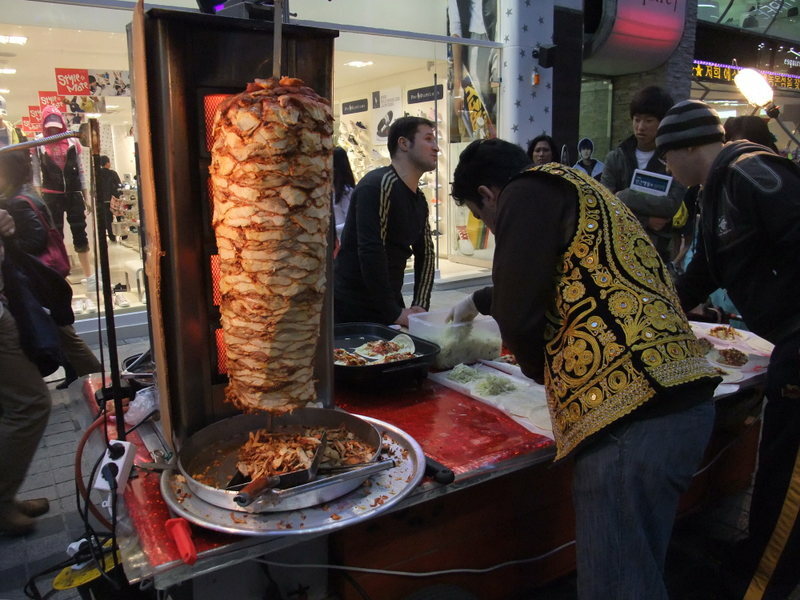 It was the booth for experiencing Korean culture. Some people were trying to make some crafts or use writing brushes. However, it was not unfamiliar to me. I enjoyed just the tune of the instruments. 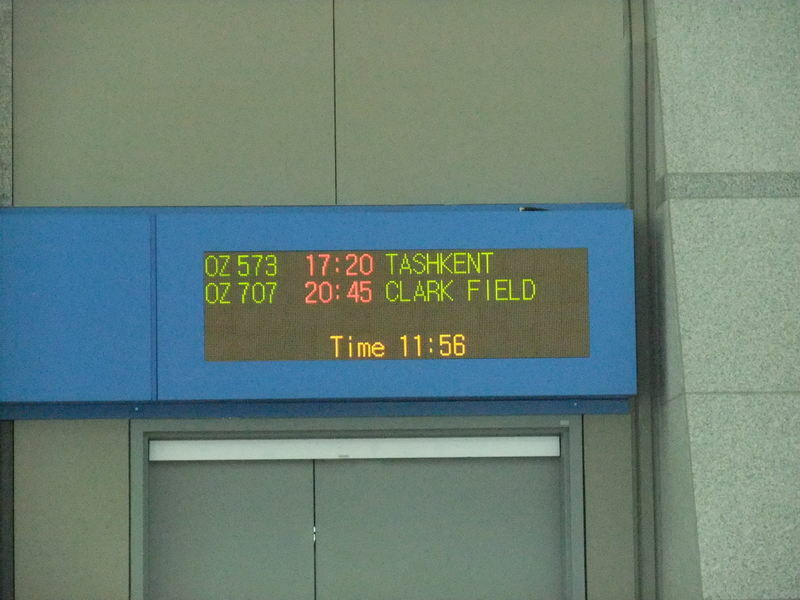 I saw the sign on the gate saying "TASHKENT". This city isn't so well-known in Japan. I realized that this airport was specifically an international hub airport. 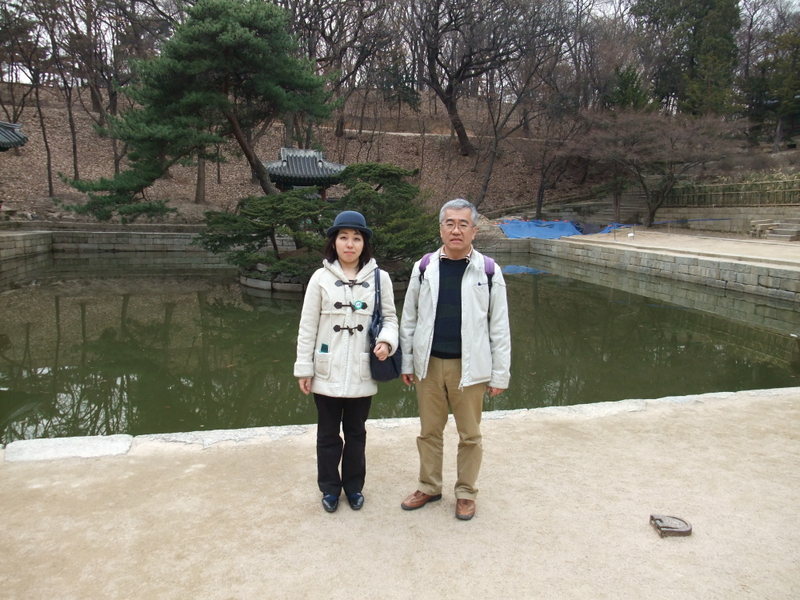 At the same time, I remembered the miserable history of some Korean people. Stalin adopted the migration policy of Korean people and many Koreans were forced to move into Central Asia about 70 years ago. Many descendants must have lived in Tashkent. Stalin did lots of horrible things against surrounding countries, but the present Russian Government hasn't apologized about them. What a lack of morals! 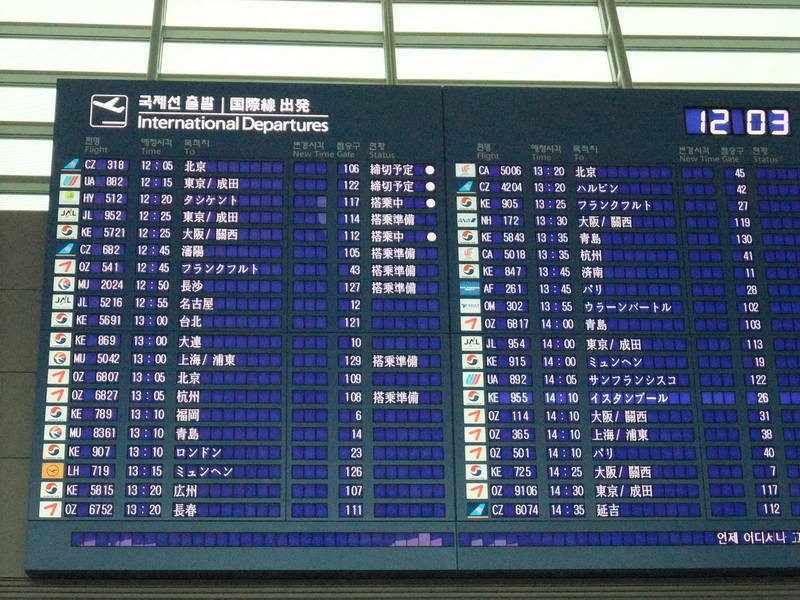 This is the information board for international departures. Every time I see it, I feel my heart beating loudly. There are many places in the world and I hope that I can visit as many places as possible. I'm just thinking about visiting Freiburg, the sister city of my home town, this summer. It is only a plan now, but I'd like to make it come true. 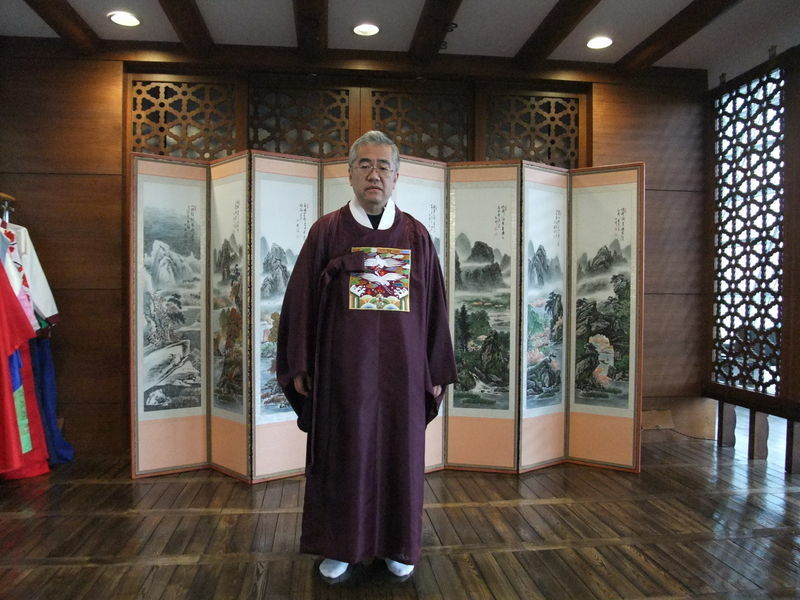 I tried some Korean traditional clothes on. These clothes sounded like they were for the nobles. There were many beautiful clothes for ladies here, and I regretted that my daughter had already left. This picture was of my lunch, ramen. 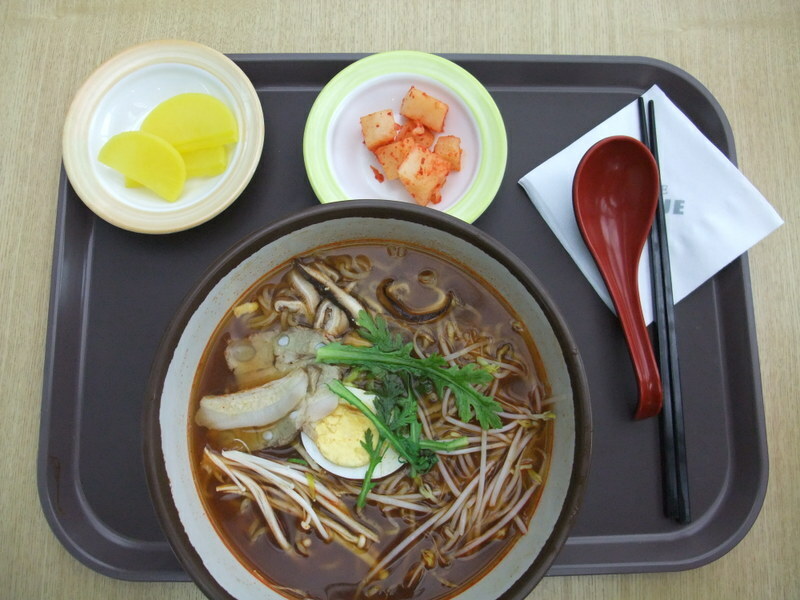 This ramen was so-so, but it was intersting that kimchi wasw added to all the food in South Korea. After getting tired from walking, I moved to my depature gate. At that time I found a wonderful network service. I'll show you two pictures about it. 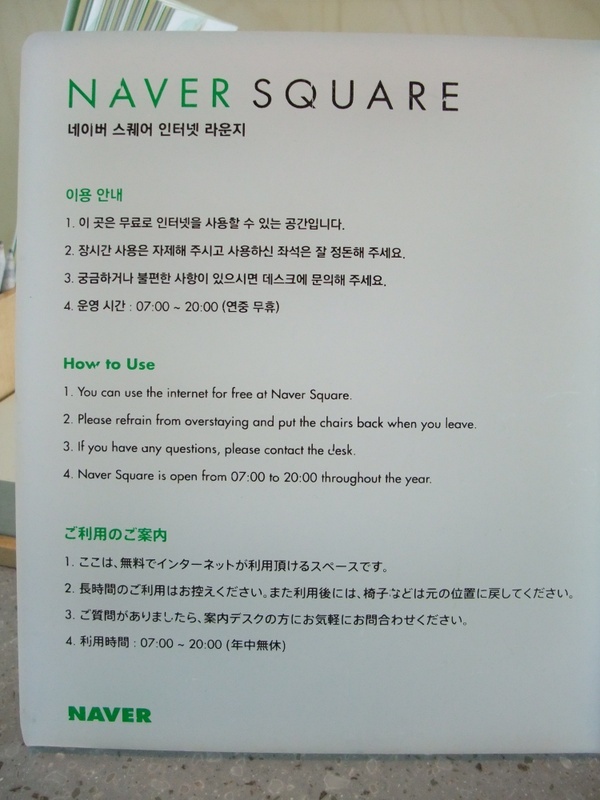 It was called Naver Square. Naver is a famous network service in South Korea and offers free access to the internet around here. 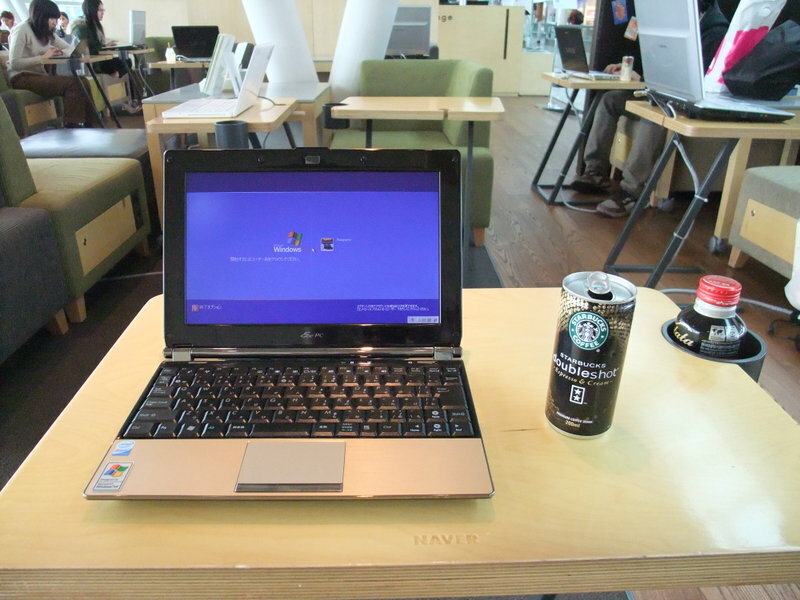 I dropped in at the square with a canned coffee and took my PC out of my daypack and turned it on. My pc was easily connected to the internet. It was very useful. I read some news in Japan while I was in Seoul. I checked my e-mails and replied to some of them and started writing these trip notes. We got out of the hotel at about 7:00. My flight was at about 15:00 hours, but my daughter's was at about 11:00. We had to start for the aiport this early because Incheon Airport was 2 hours' drive from our hotel. After having arrived at the airport, I looked for the coffee shop for our breakfast. I'd like to have chosen a Korean style one, if I could. 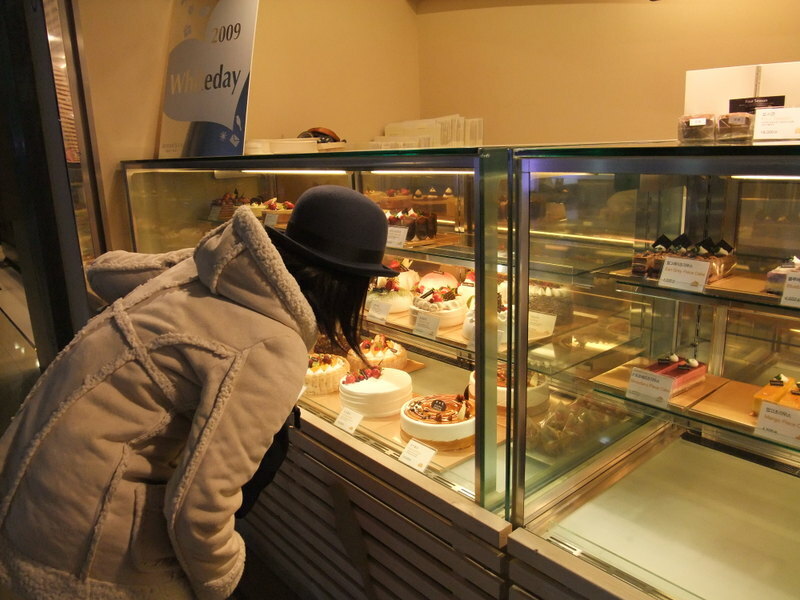 Finally, we found a rice cake shop. We had breakfast here. To my surprise, the shop was the same as the shop we had dropped in at in Insadon the day before. It seemed like they were chain stores. I took the second picture for my trip notes. 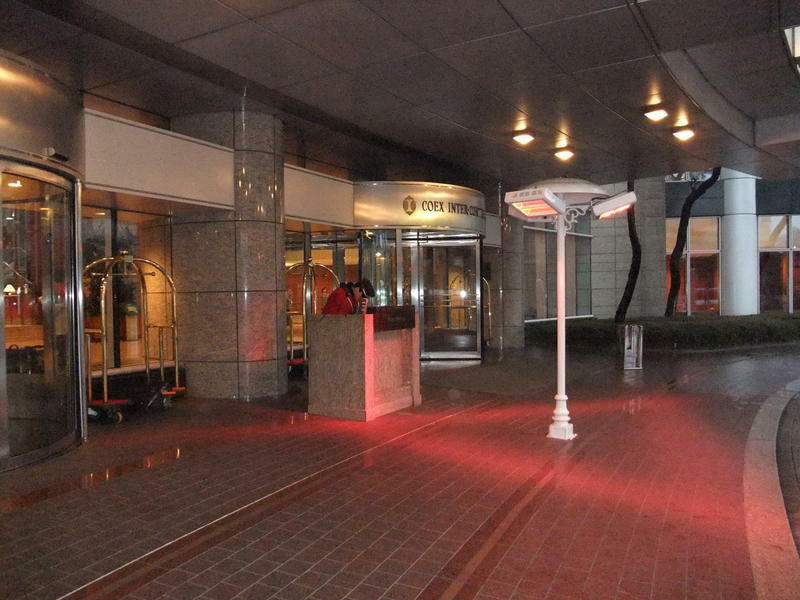 The first picture shows the entrance of our hotel. When I arrived, it was dark and when I went out, I walked out of the basement and so it was the first time I had seen the main entrance of the hotel. The last picture shows our breakfast on our last morning in South Korea. These rice cakes would hit the spot. Traditional Korean tea and these rice cakes were the best match. After breakfast, I sent my daughter off to the departure gate. She left for Tokyo alone. 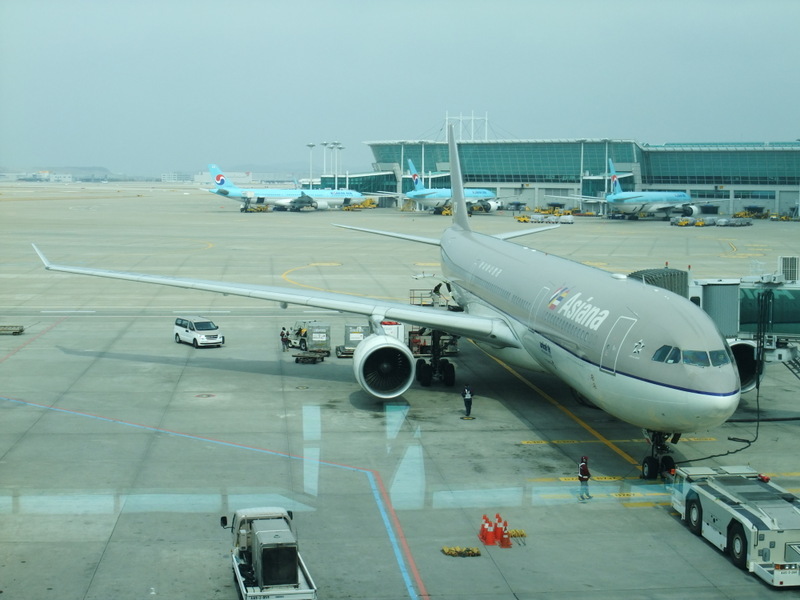 I used Incheon Airport this time for the first time. I had four more hours until my flight and enjoyed sightseeing in the airport, though I knew the airport was huge. 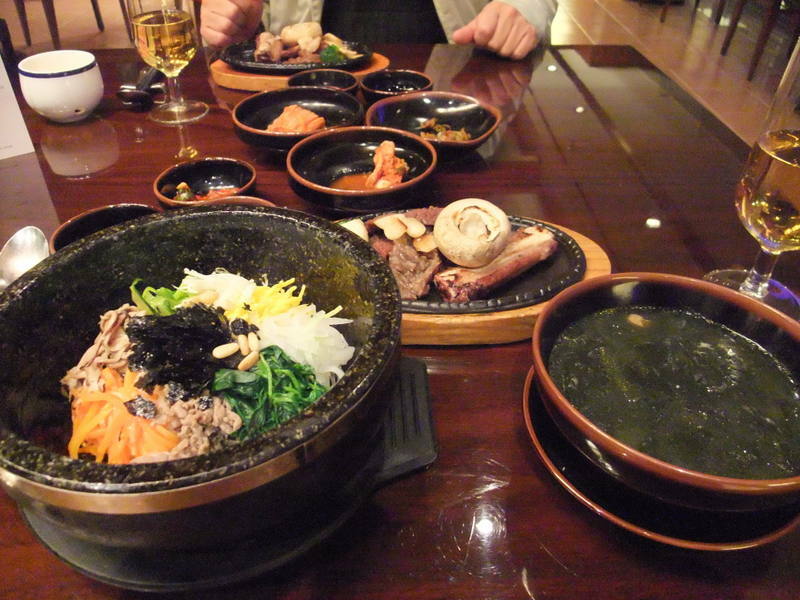 We decided to have dinner at our hotel on our last night in Seoul. 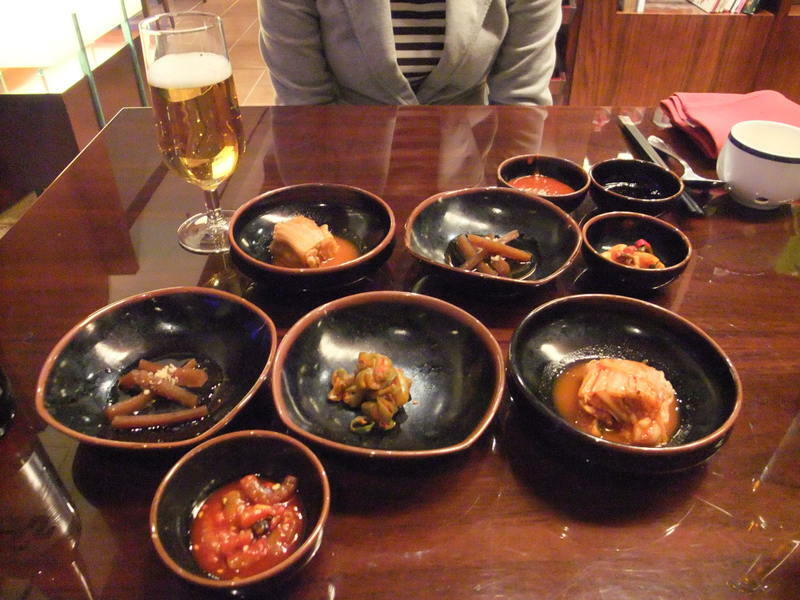 I chose the traditional Korean style dishes as I'm showing below. 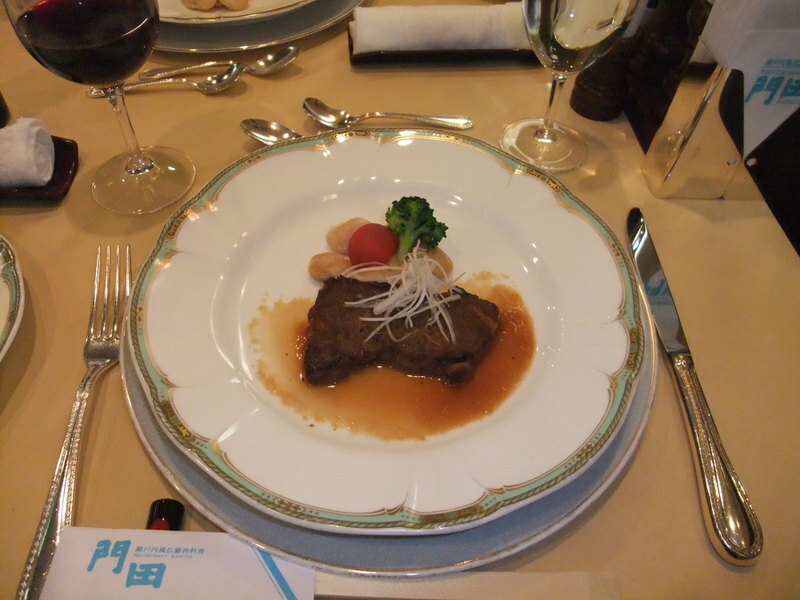 As many high-class hotels are like this, however, the price of dinner was expensive, but not so delicious. I was disappointed. After the dinner, we tried the black jack at Seven Luck Casino in the hotel. It was our first time, but we enjoyed it. We lost about 3000 yen for one hour, but it was fun. Look at the picture. Eri was posing in it, thinking about how to pack her suitcase. This suitcase was bought in Seoul to bring souvenirs back to Japan. She didn't have any big suitcase and was going to get one in Seoul. Shopping in Seoul has an advantage over Japan now. It was a good idea. Her new suitcase was very nice and was a reasonable price. However, it was just smaller than her souvenirs. The big bag before her was dried laver seaweed. It was extremely light, but took a lot of space. It was fun seeing her consider how to do it. 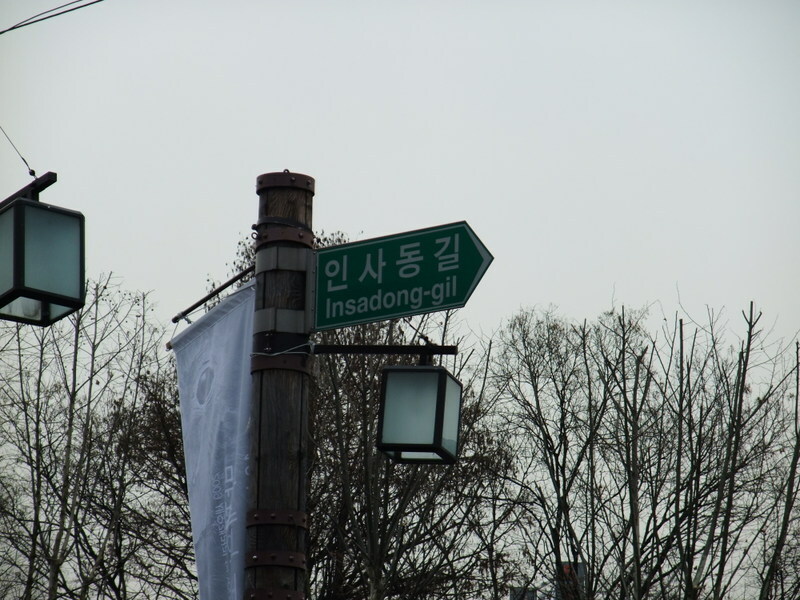 We were shown Insadong, next. 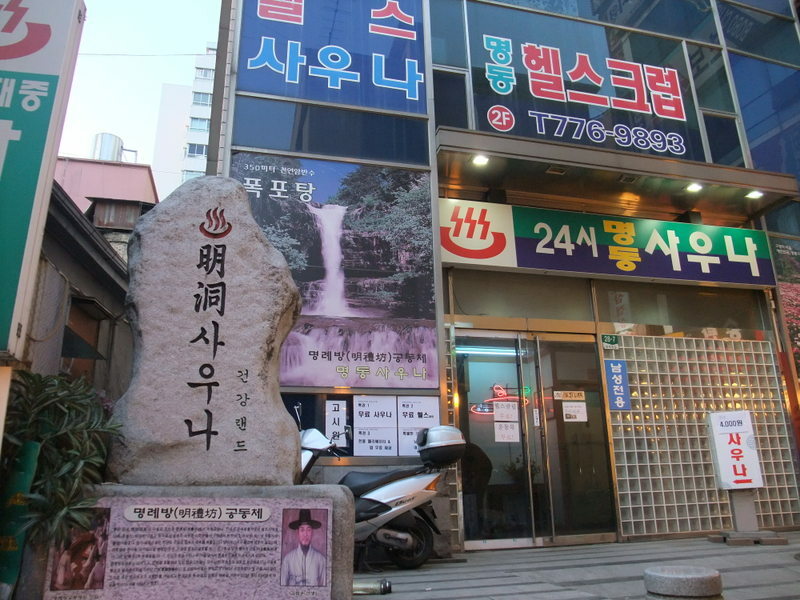 This area is well-known as the center of the Korean culture. There were many fancy shops and restaurants. We got 30-minutes' free time and walked around. Look at the first picture. 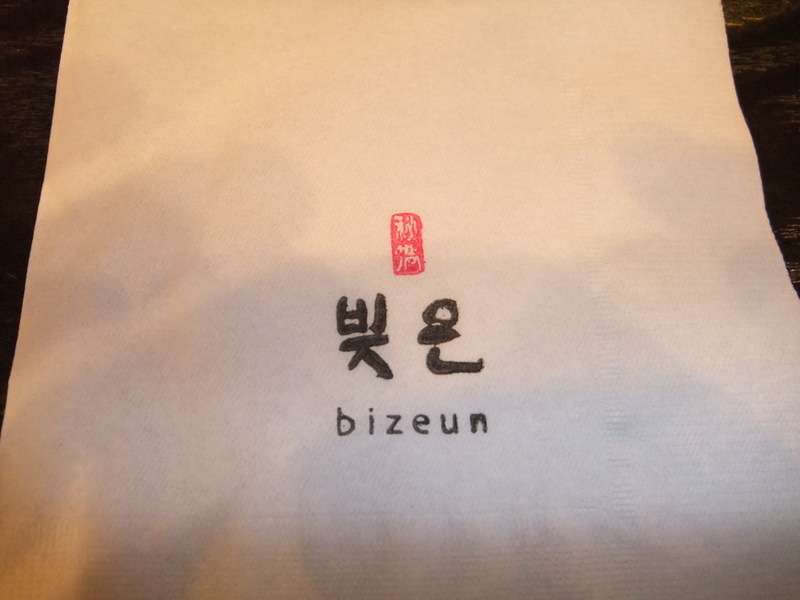 The Korean letter "떡" attracted me. This means "rice cake". 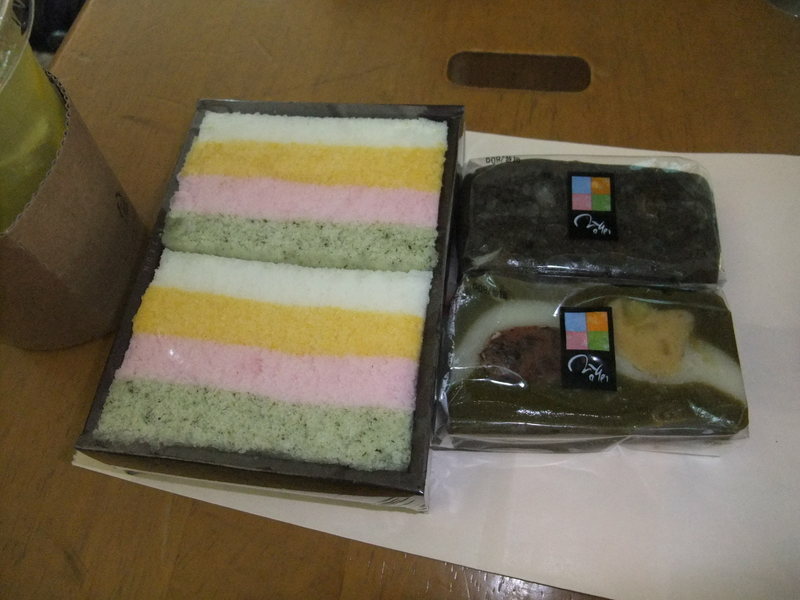 Rice cake is also made in Japan when they celebrate something, such as a new year, weddings, newly-built houses and so on. 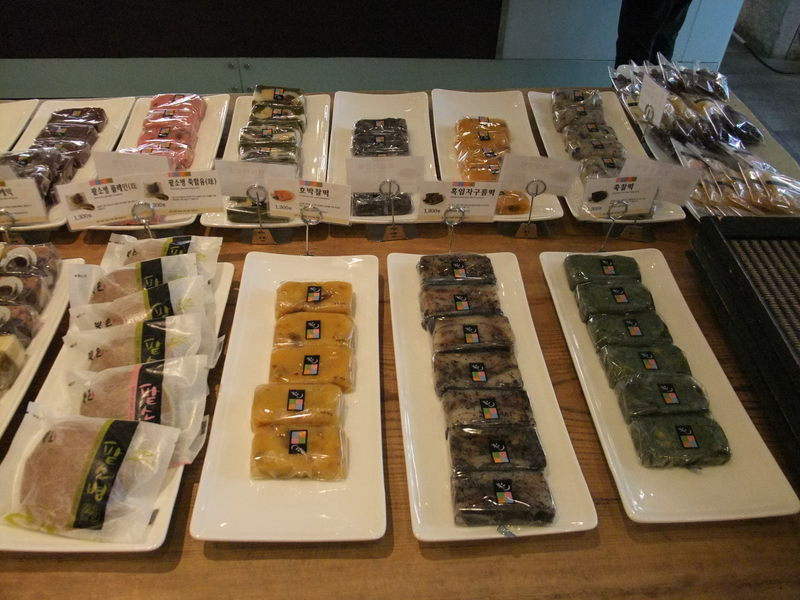 It sounds like both Koreas have the same culture, but Korean rice cakes have much more variety than those of Japan. This was introduced on an educational TV program of the Korean language, which I watched and learned Korean from. That's why I was intersted in Korean rice cakes. I bumped into this shop by chance, but it might be a logical consequence gifted from the God of "learning". I entered the shop without a second thought and found a few tables inside. It seemed like we could try rice cakes with some drinks. 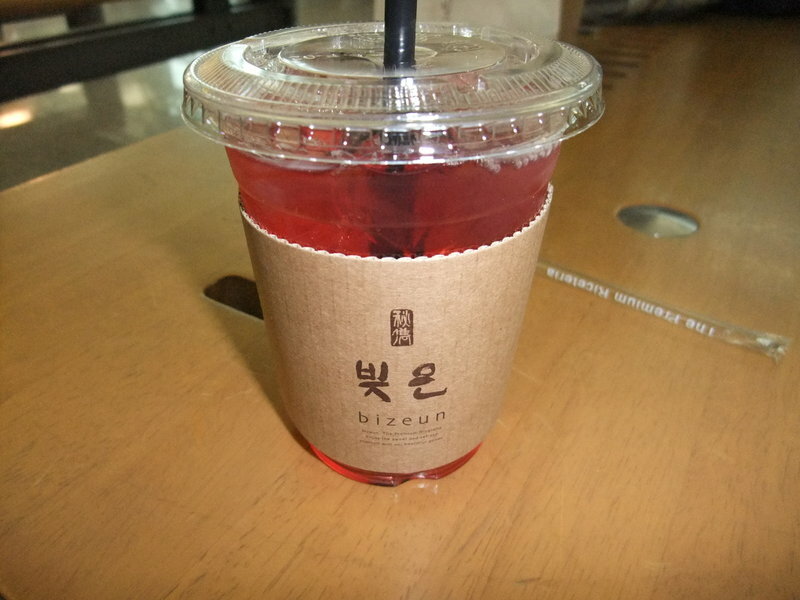 I chose two rice cakes and ordered the traditional Korean tea, which I wanted to try after seeing it on the TV. There were many kinds of rice cakes and teas, but I didn't have enough time to choose and followed the suggestion of the waitress. It was great and I recorded the name of the shop with my digital camera. There were many stalls outside. Eri was curious about it. I wanted to visit there again and recorded the name of the street with my camera. 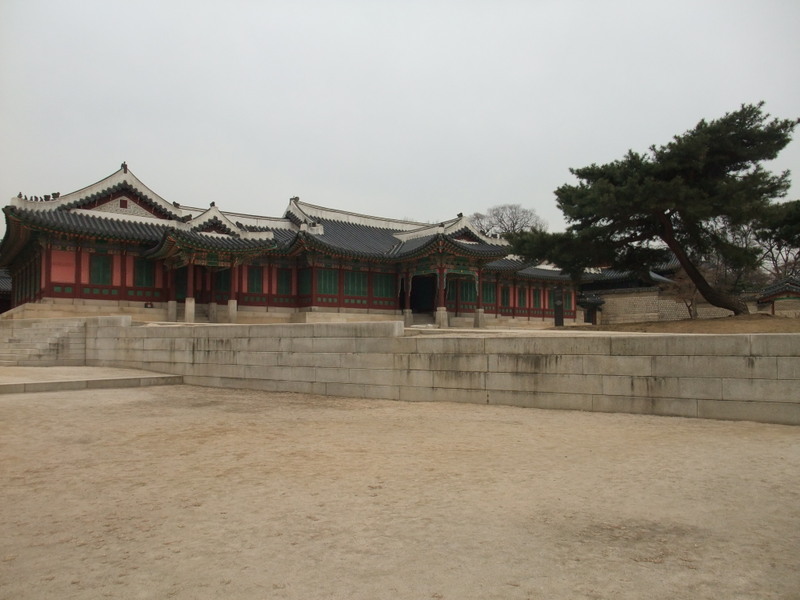 We visited Changdeokgung, which is an old palace of the Korean king. 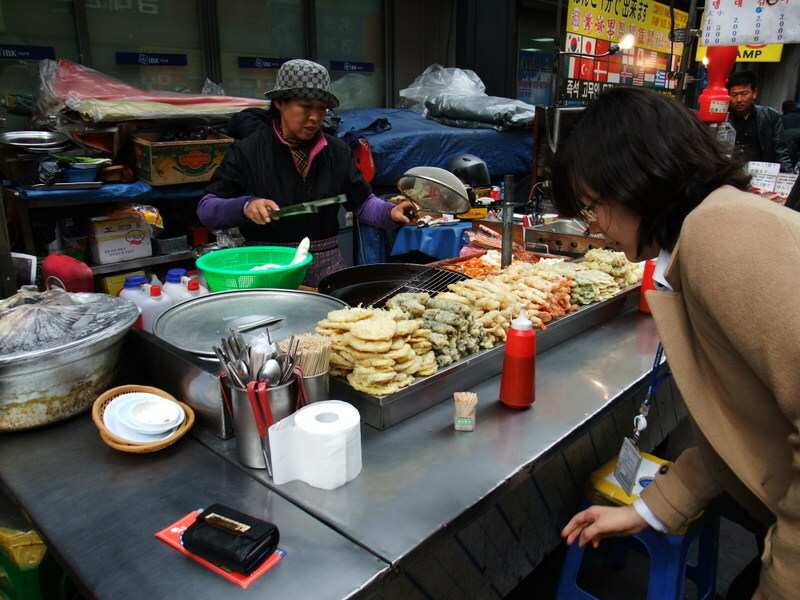 This was, I think, the most popular tourist's attraction in Seoul. Several guides were always ready at the tourist's information center. 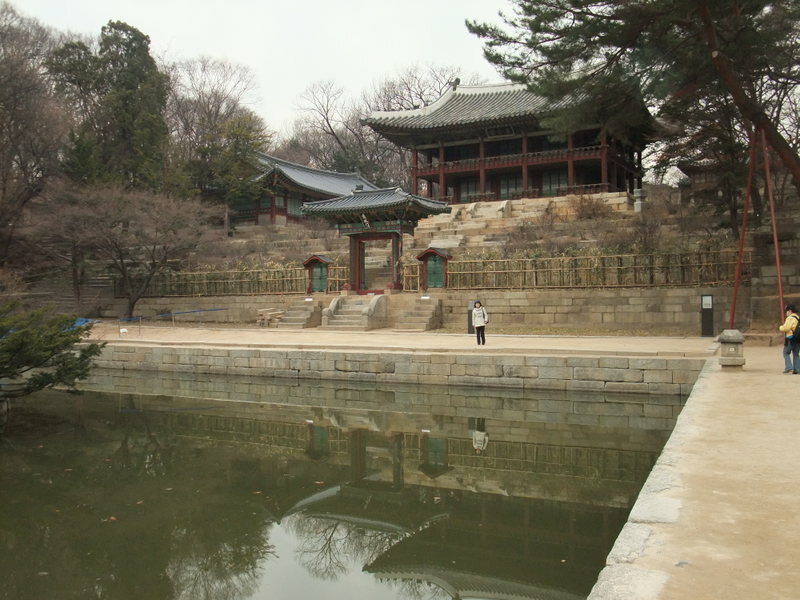 Korean, Japanese, English and Chinese speaking guides started into the palace every ten minutes with about 30 people. Our tour group joined the Japanese group, leaving our original guide at the entrance, and took a walk in the palace for about one hour having the explanation from the new guide. I took lots of pictures and I'm showing you some of them with some explanations. The first picture is of the main building of the palace. Small posts that arrange in the yard say the rank of the nobles on their surfaces. When in some official events, the nobles seemed to have lined up at their ranks. 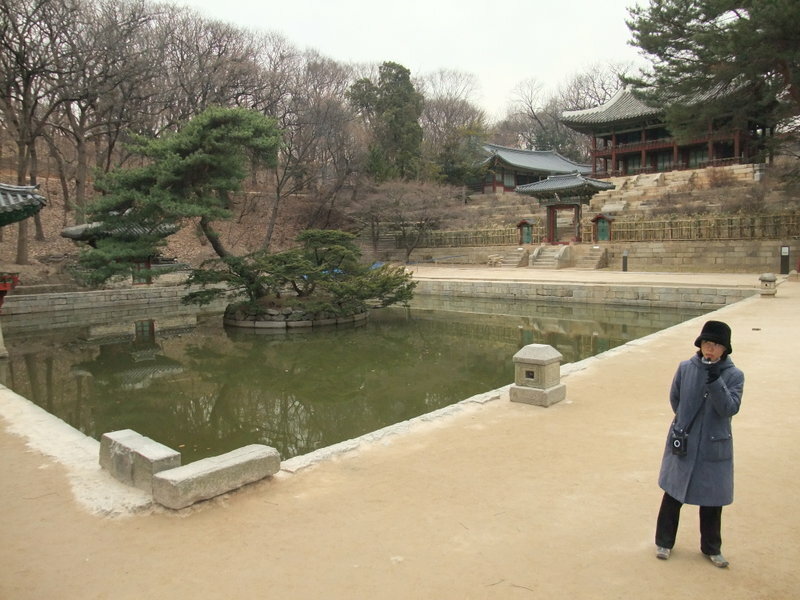 I've watched the scene that had been shot here in the TV drama, "Dae Jang Geum (대장금 大長今)" and I was eager to visit. The story was fiction, but it made me motivated to learn Korean. The old building in the second picture was also used in the drama. Our guide was very smart and friendly. I took a snapshot of her and I'll record her in my blog. This place (3rd-5th picture) was very famous because it was used in the scene in which the heroine had a chat and took a walk with the king. We were shown Chogesa Temple next. 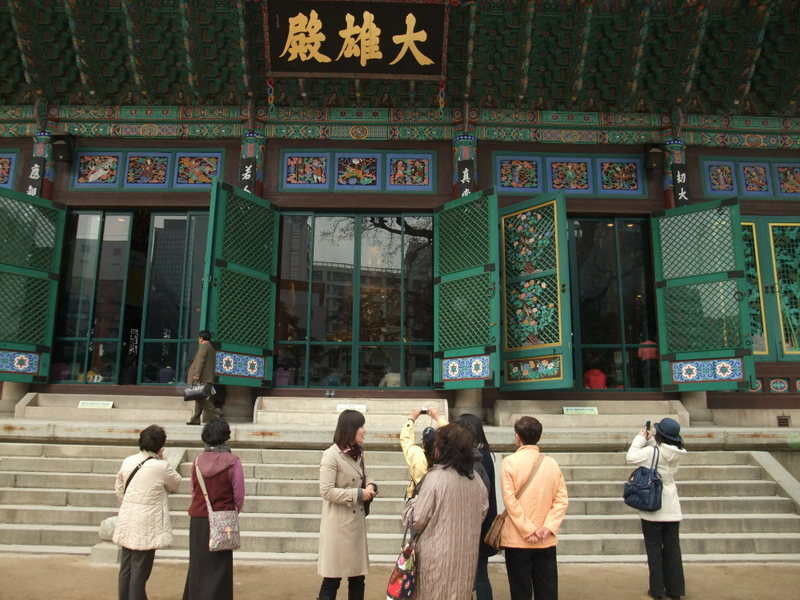 This is the headquarter temple of Korean Buddhism. 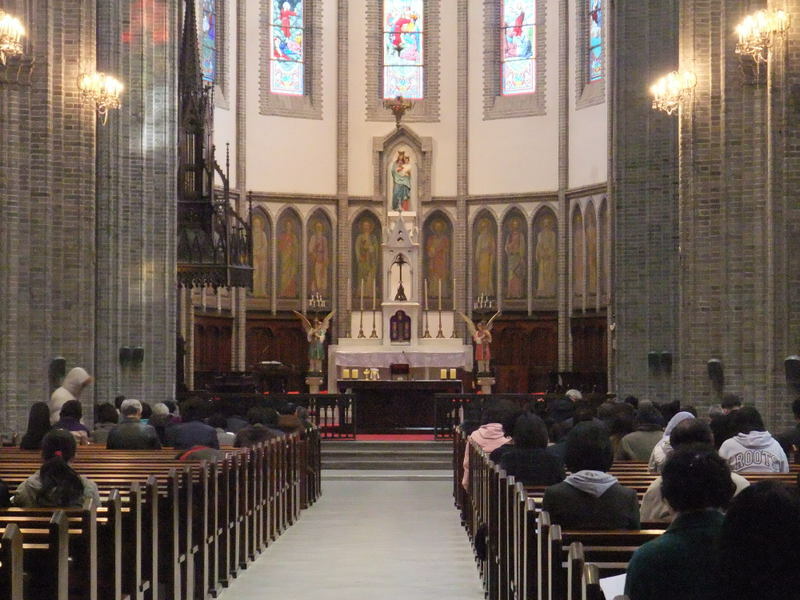 I prayed for the health of my family, relatives and friends here. I had been usually relaxed when in Japanese temples, but I didn't think I became calm with the solemn feelings here. I'm not sure, but it might be due to the untidiness of the temple. We stayed here only for ten mimutes. I expected the lunch because the guide told us that she would show us this nice restaurant where a black pig, produced in the Jeju-do island, would be served and delicious. Besides, I'm now interested in the history of the island and am learning about it. These reasons made me joyful. The restaurant was clean and tidy. 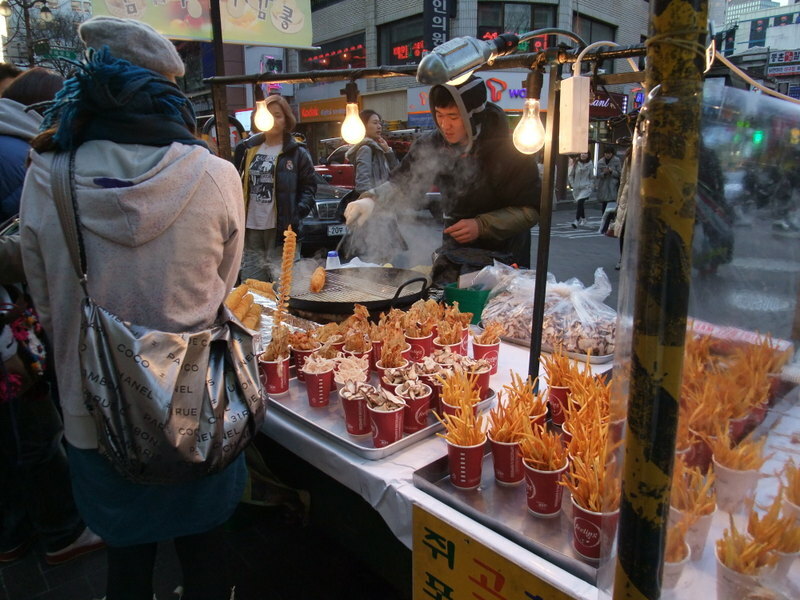 The atmosphere of it was far away from that of the Namdaemun Market. 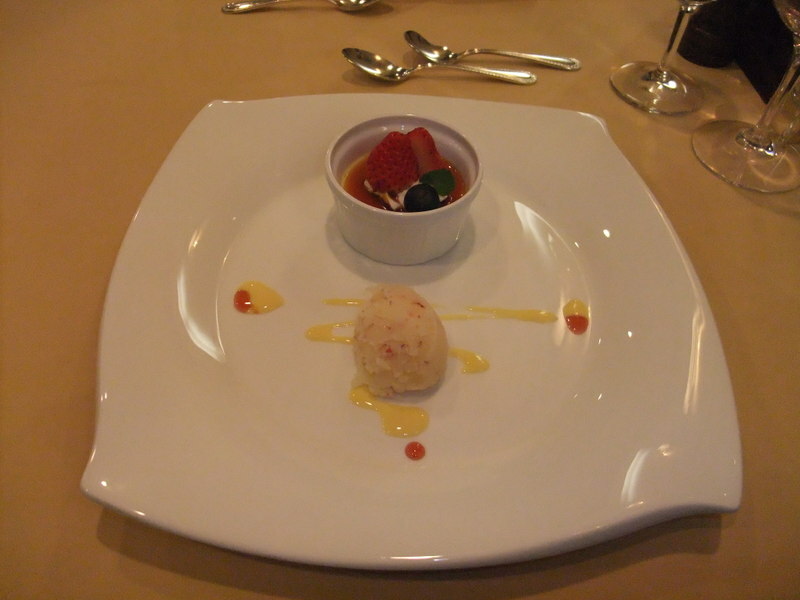 Actually, the dish was very delicious and I enjoyed it. At the end of this entry, I'm showing five pictures. I'm sure you can understand what the dish was like from the pictures. 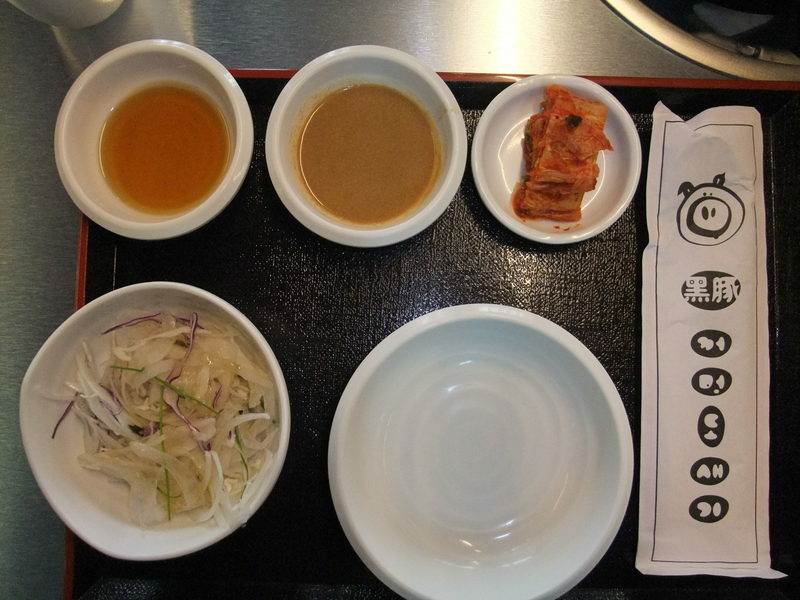 It was a fully Korean style lunch. Metal chopsticks and a spoon were put in the paper bag being placed longitudinally in the second picture. 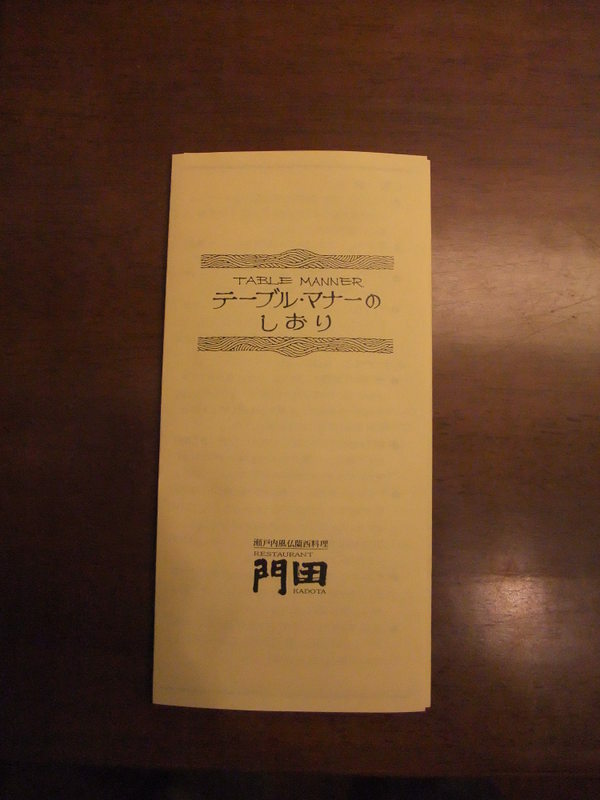 In the next picture, the specialty was written in Kanji. These types of characters are commonly used in Korea and Japan, though people from other places than both countries might feel curious. Japanese and Korean language surprisingly resemble with each other grammatically. It means that it's easier to learn each other's language for Korean and Japanese people, than other people. The last picture shows the price list. If you are a Japanese person, try to convert them into Japanese yen. 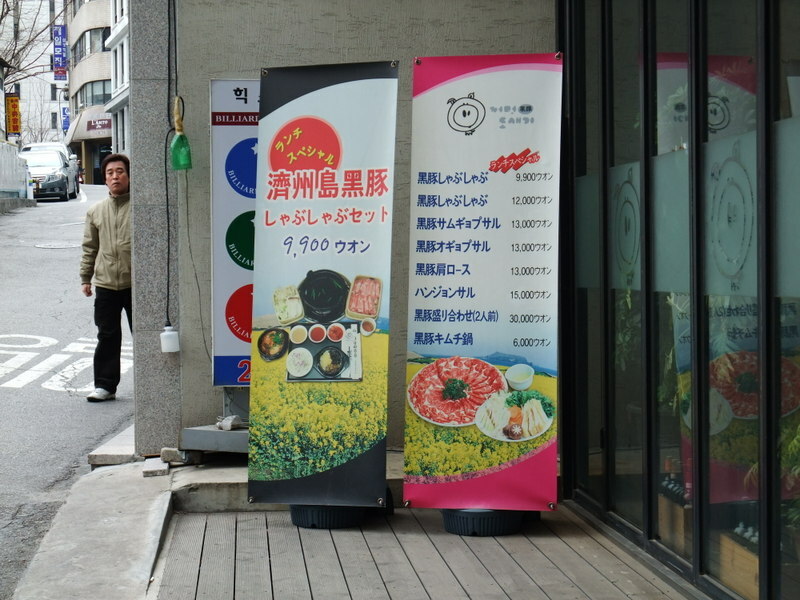 9900 won changes to be 750 yen. 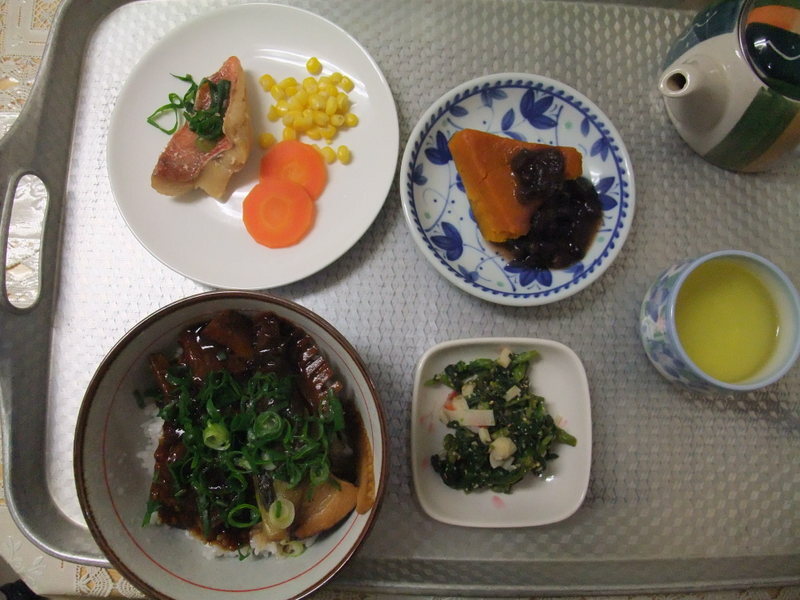 Our lunch cost 750 yen with endless helpings of rice and accompanying dishes. 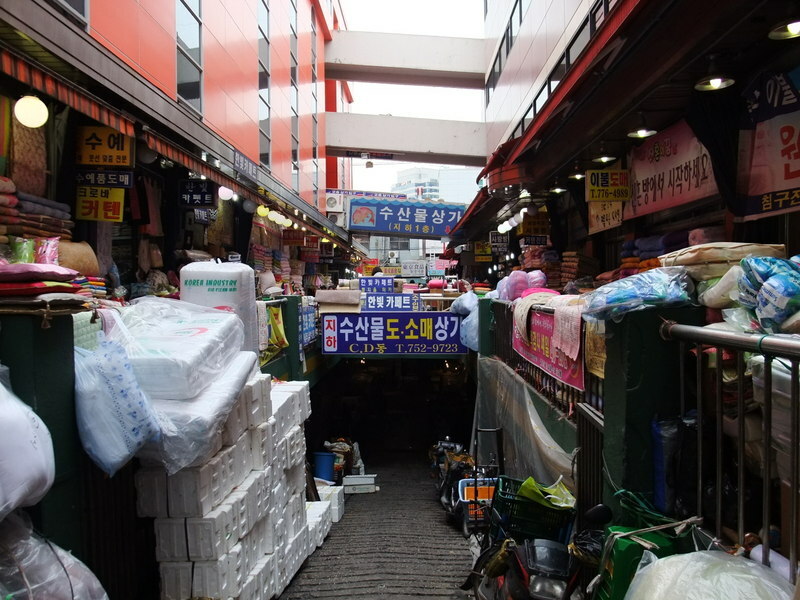 We visited Namdaemun Market, next. I'd never seen a place like there. It was so crowded, chaotic and muggy. There was everything there. I don't have suitable words for describing the area now. Just imagine what I want to write. While we were walking in the market, we were frequently spoken to like this, "We have perfect fake stuff. Come into the shop!" We didn't accept their offer, it must have been an illegal business, but we enjoyed seeing various shops. I'll show three pictures here. 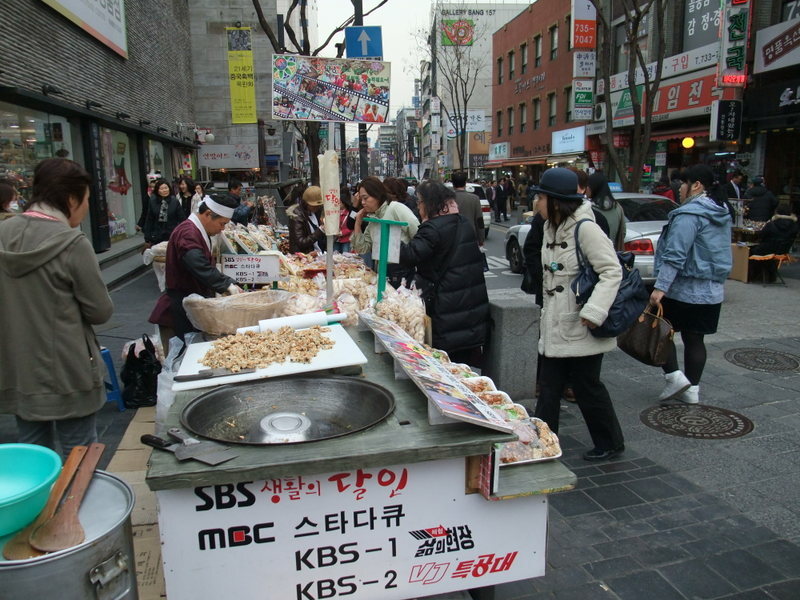 The first picture shows a stall on the street. I really love these kinds of stalls. I wanted to get something and have a canned beer with them, but remembering the words of our guide, I barely held back to stretch my arm. Eri was attracted by the stall in the second picture and bought something. She is twenty something, but looked like a little kid before this stall. We strayed into a sea food area. The last picture shows the exit of the market. This market wasn't connected to any seaport, but the fish looked fresh. The kinds of fish were just the same as Japan. 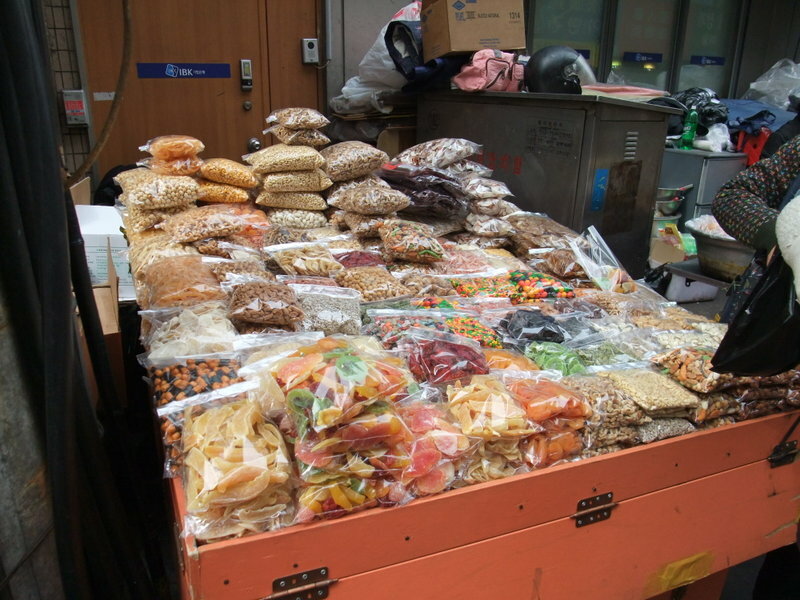 However, thinking of the pollution of the yellow sea, off the coast of China and South Korea, I didn't feel like eating them. Actually, we didn't eat shore fish during our stay. 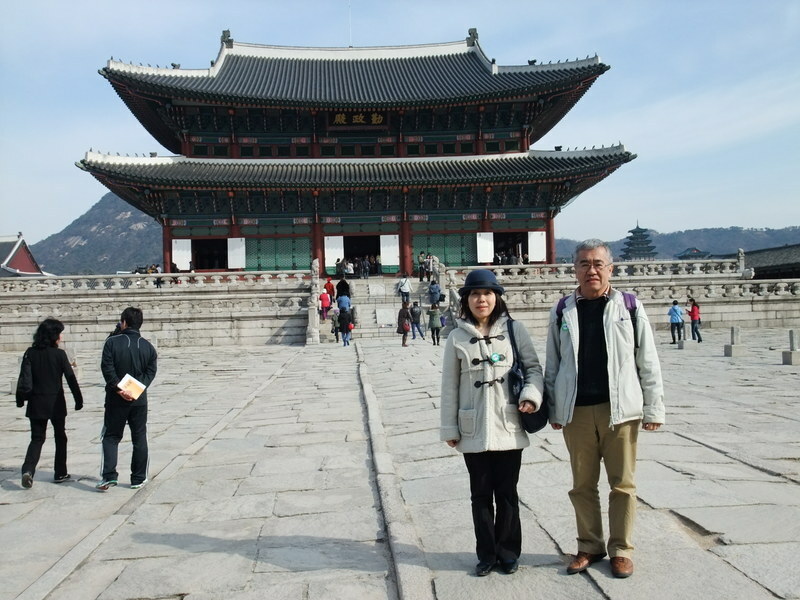 On the second day in South Korea, we joined another bus tour group that went around Seoul City. The bus was going to drop in at several famous sightseeing spots. 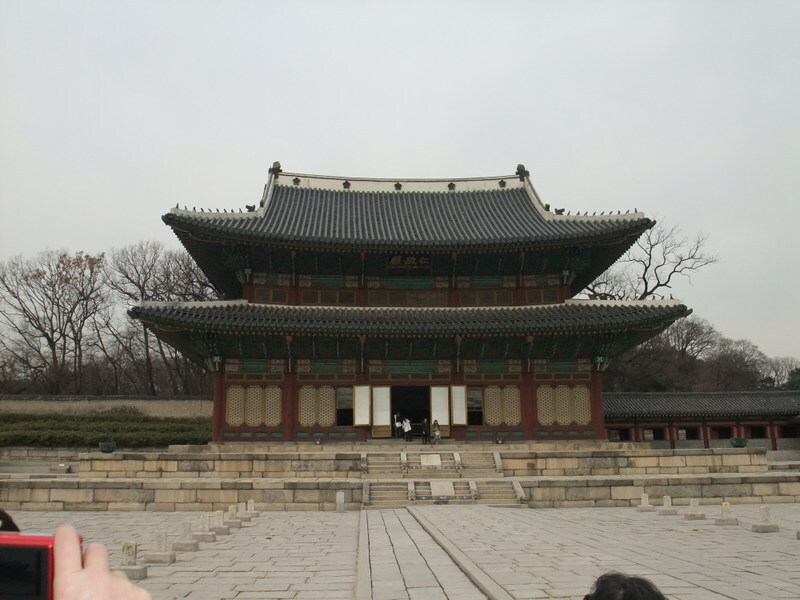 At first, we were showed Gyeongbokgung (경복궁 景福宮), which used to be the royal palace of Korea and is now under reconstruction. It was burned out by the big fire in 1553 and damaged by the Japanese soldiers in the late sixteenth century. 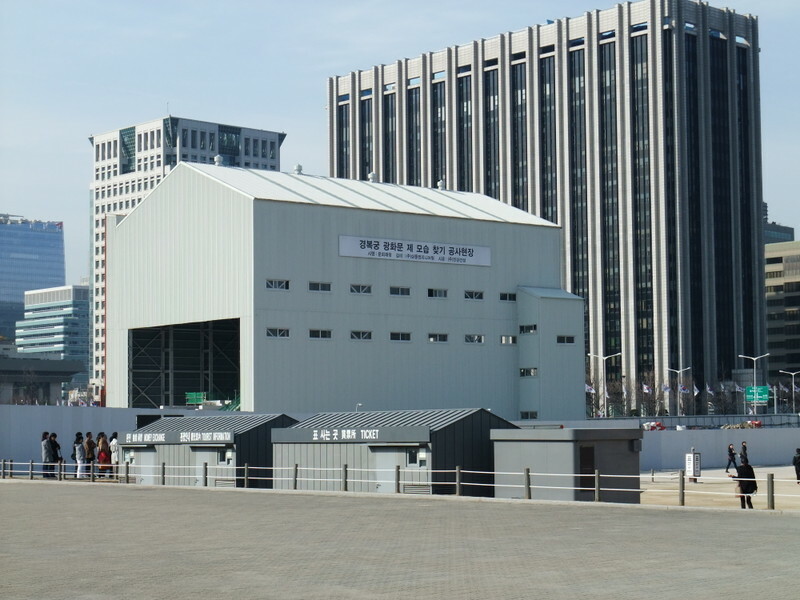 Under the rule of Japan, the post of Governors-General of Korea had been located here. The guide didn't explain this point clearly, but these buildings were built in recent years. The Koreas had been dependent on the countries that had existed on the Chinese Continental until 1895. The subjected people couldn't preserve their original and traditional heritage. It was very sorry. Anyway, I'll save the story for another day. 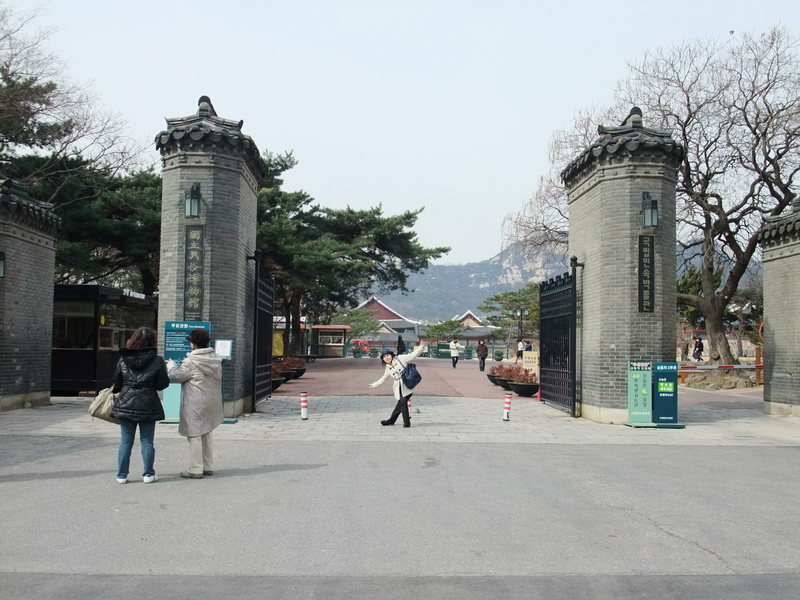 The first picture shows the construction of Gwanghwamun (광화문 光化門), the main entrance of Gyeongbokgung. It was regrettable that I couldn't see it. In the second picture, we are standing on the yard in front of the main building. I got explanations about this former palace from our guide and I sometimes felt doubtful, but I let it go. That's another story for another day. 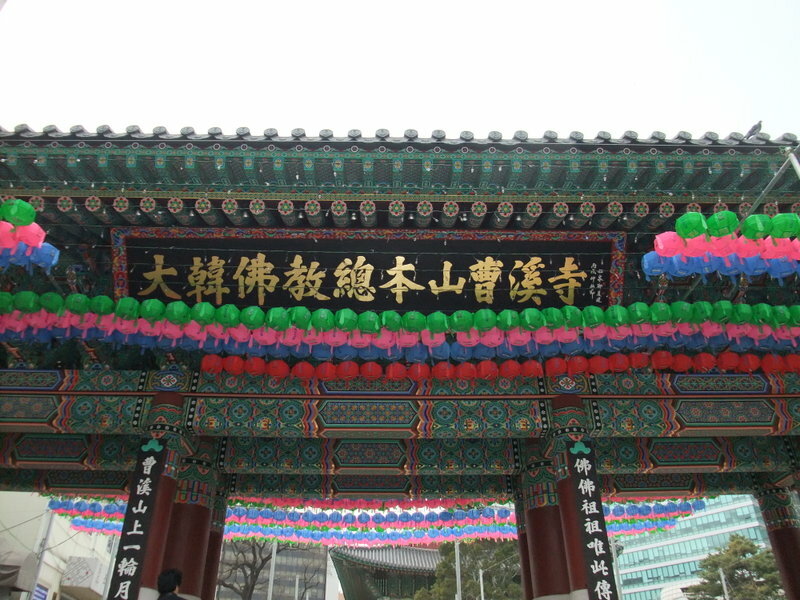 The last picture is of the main entrance of the National People's Museum of South Korea. (国立民族博物館 국립민속박물관) This museum originates from the Korean Crafts Museum built by Japanese craftsmen in 1924, but that fact was being concealed. 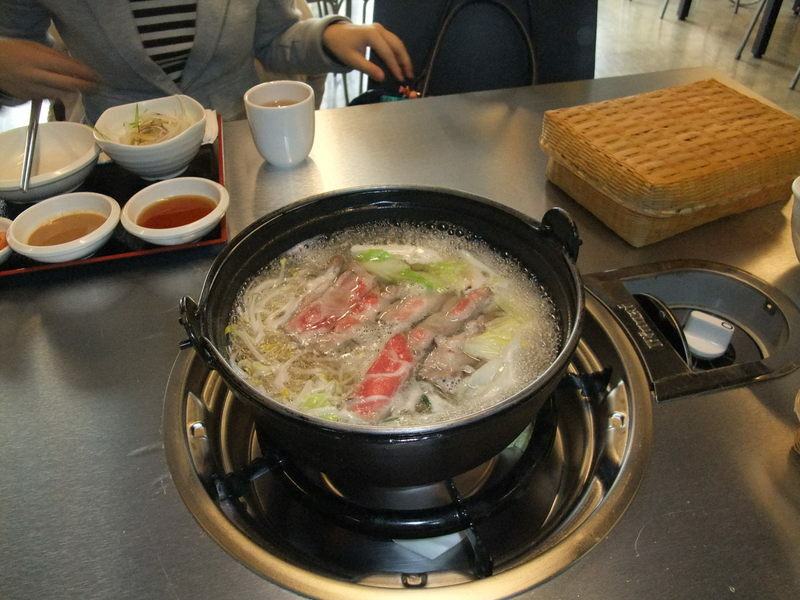 We chose Samgyetang (蔘鷄湯 삼계탕) as our dinner at the end of the day. 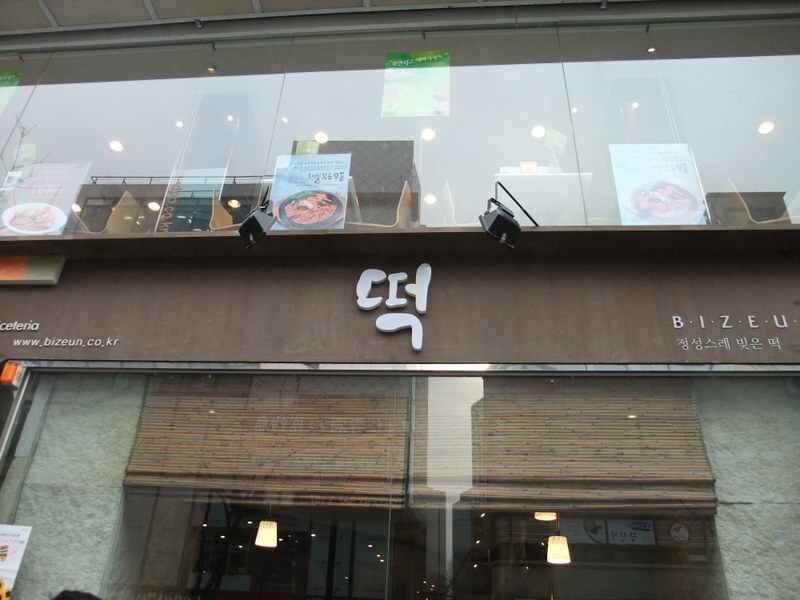 The restaurant was located in Myongdong and specialized in serving Samgyetang. I had a reason to select the dish. 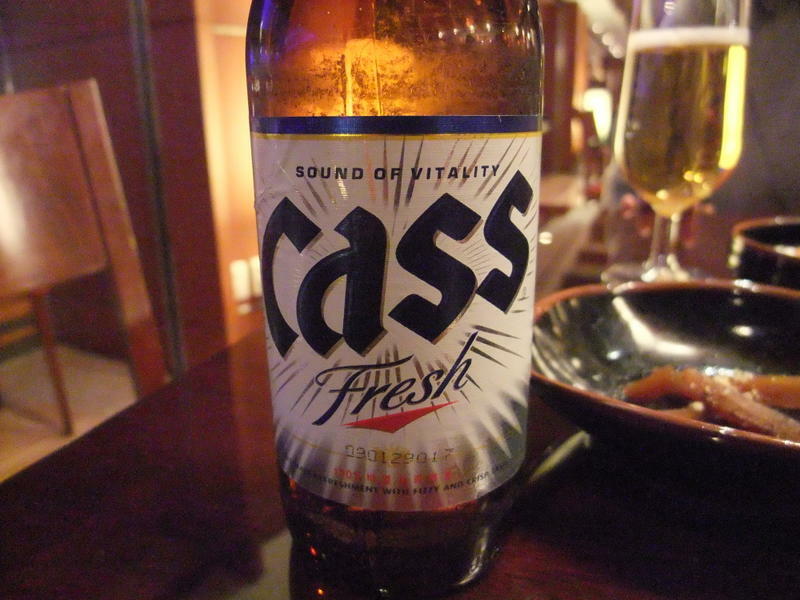 I'd had it in Japan and wanted to confirm in Seoul whether it had been a real traditional one or not. 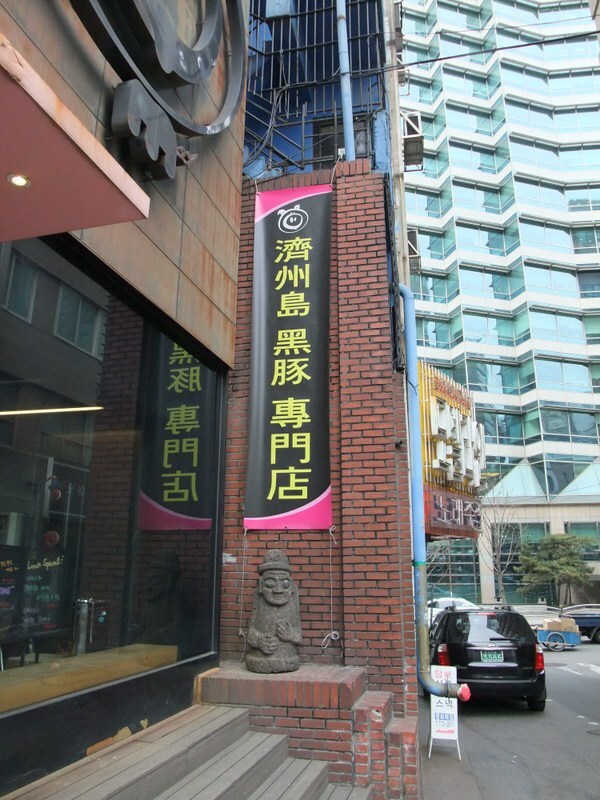 I'd written about a Korean restaurant in my city. http://kumo.typepad.jp/weblog/2008/06/korean-eating-h.html The result was, it was just like the dish that we had in Japan. I ate a silky fowl and Eri ate a plain old fowl. It was nice but inexpensive, I thought. When I talked about it to a friend who knows more about South Korea, however, he told me that it was the tourist price and it was usually lower in price. I was surprised to hear it and felt the influence of strong yen and weak won. 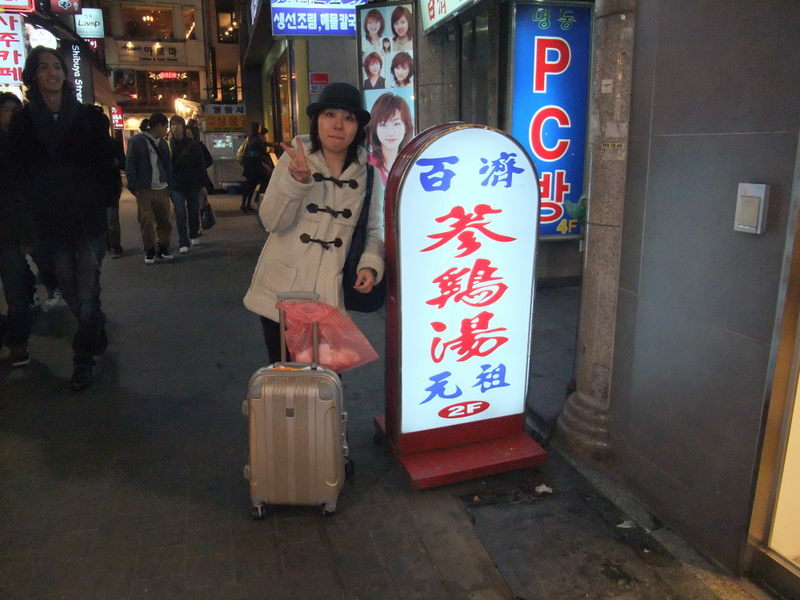 The third picture is of Eri and the signboard of the restaurant. I took it for a memo of the restaurant's name. 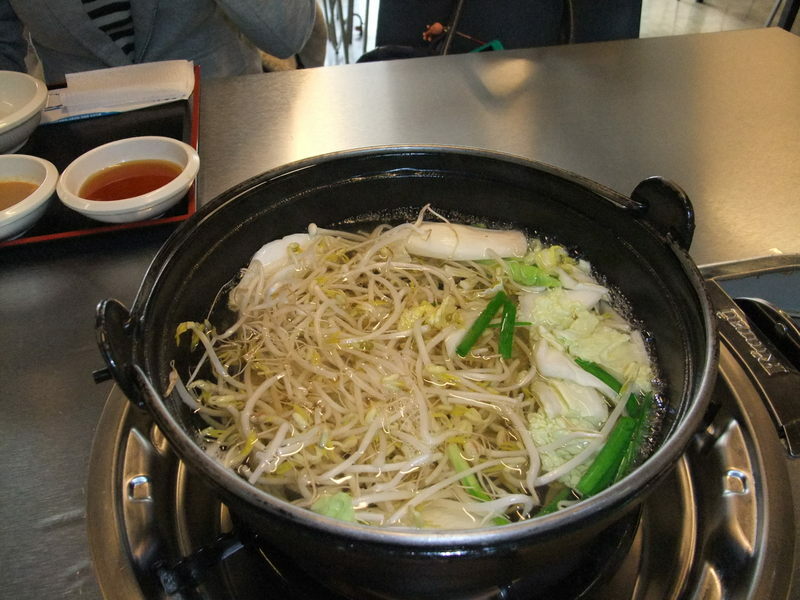 I was full with this dish, but Eri didn't seem satisfied enough and she bought a cake on the way to our hotel. Incredible! It might be, I thought, because of her youth. It was just a few days before White Day. 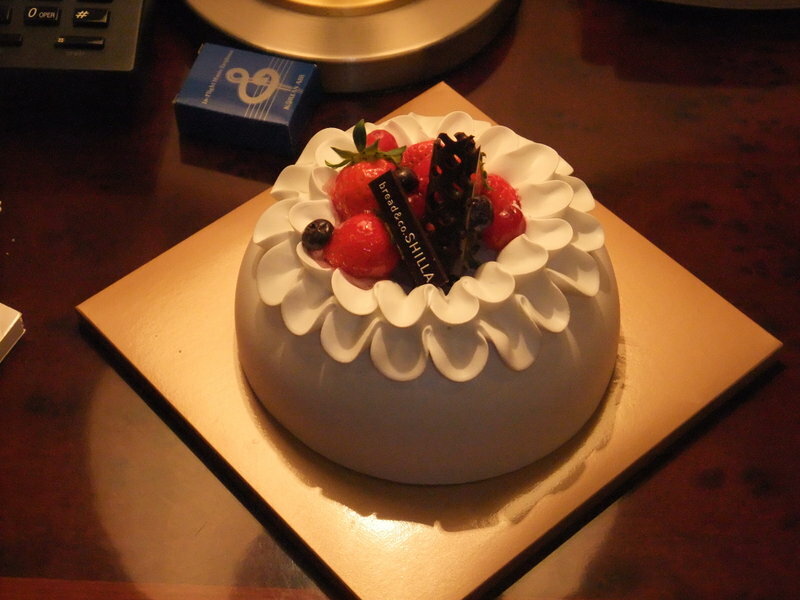 I thought that White Day was the original event of Japan, but it was the same in South Korea. Eri looked like she was being pulled by the sign saying "White Day". We felt various things were inexpensive. Things weren't cheap, but inexpensive. 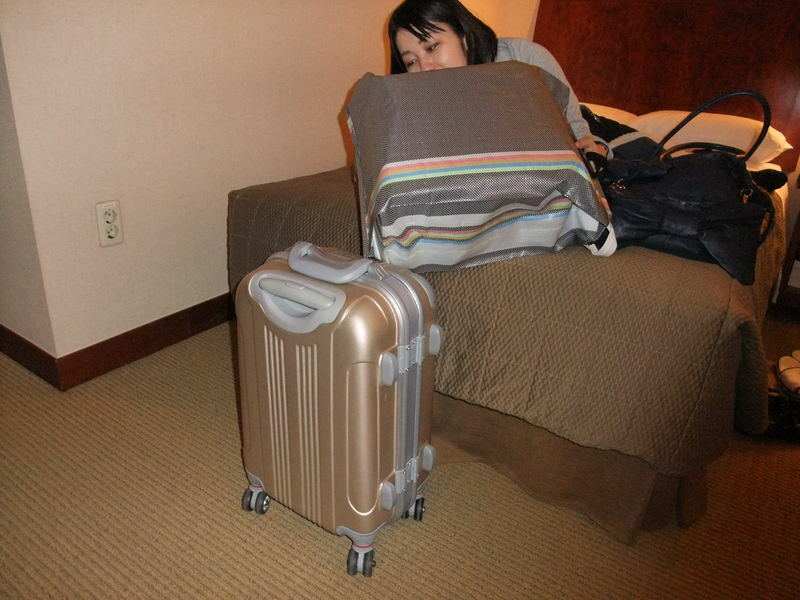 Eri bought a baggage first to bring things back to Japan in it. 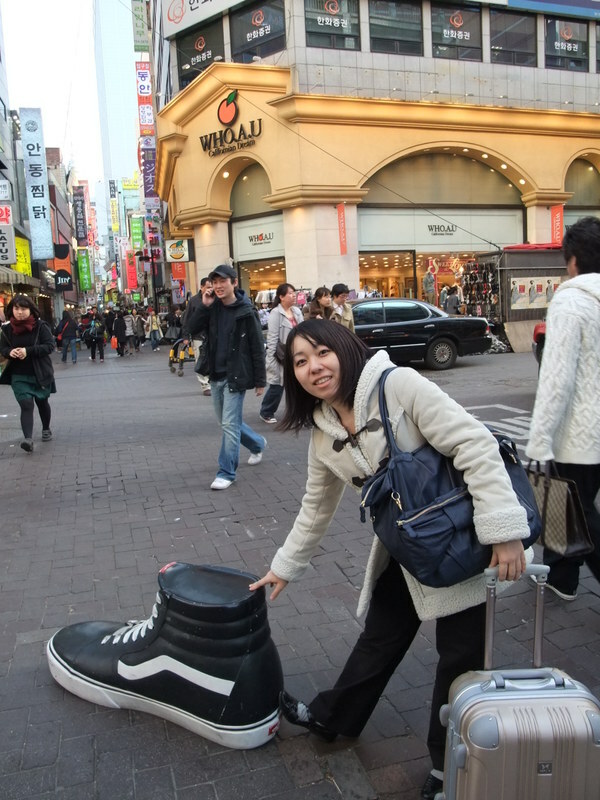 This picture was taken just after getting her new shoes at ABC MART, which is a well known shoes chain shop in Japan, too. 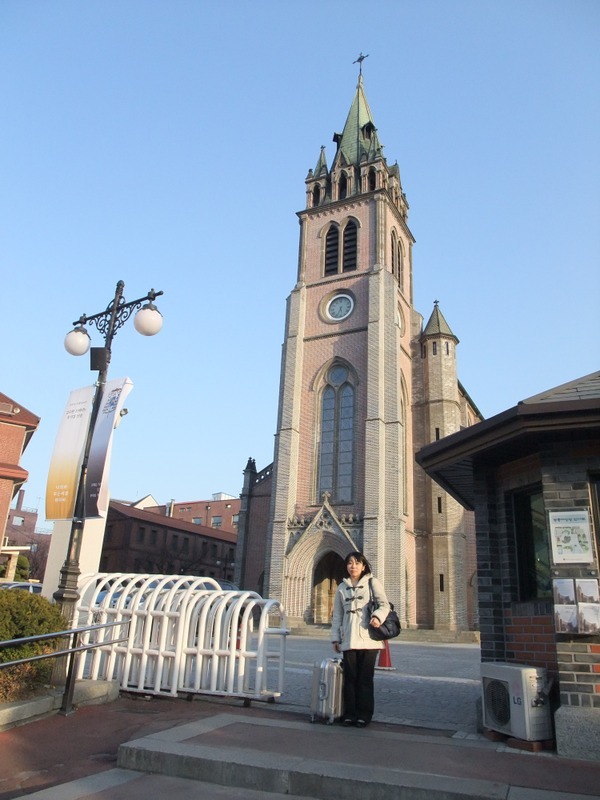 The next two pictures were of Myeongdong Seongdang(明洞聖堂 명동성당), the most famous Catholic Church in South Korea. I was a man of curiosity and entered it. After listening to a few carols, we went out. We were busy seeing around the street. I stopped at a stall. Stuff on the table looked nice. I thought I stayed there for about ten minutes, but finally I gave up those, following the advice of the travel agent. I thought that heated stuff was secure, but Seoul heavily had yellow sand a week before. Yellow sand might pollute the stuff on the stalls. It was the advice of the agent. I remember, "Fools rush in where angels fear to tread." Eri was checking clothes here for about 20 minutes, saying "good, low-cost, nice, , ," in Korean, but didn't buy anything. Coming to me, she simply said, "It was a good lesson, I could listen to prices!" I know, Listening to numbers in Korean is difficult for beginners due to its liaison, but,,, I felt bad for a shop man. I came across a sauna bath. If I'd had enough time, I could have tried it! 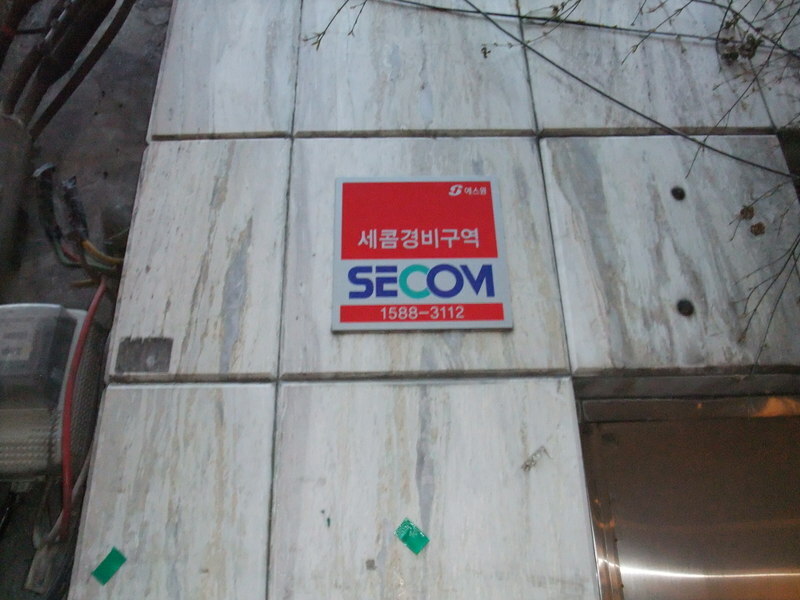 I found a warning plate of SECOM, which my house is signing on with. They spoke to me in Korean first. When I was thinking about how to reply, they changed it to Japanese, but it was not enough to communicate. Lastly we could chat in English. They were from Turkey. I feel affinity about Turkey and had a bite. It was delicious, but I don't remember the name of it. I'd like to write about Turkey later.